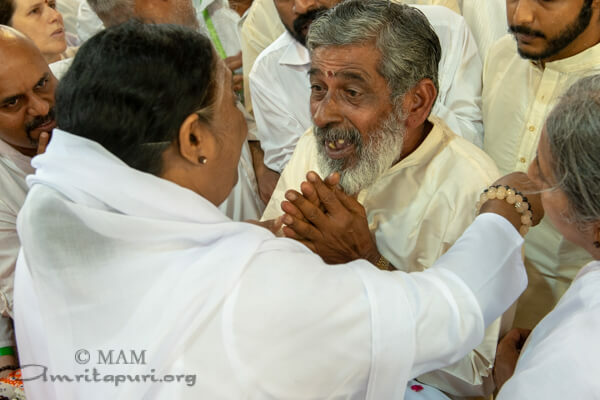 It was already 11:30 at night when Amma arrived in Hyderabad after a long drive which had started right after the end of darshan in Bangalore. 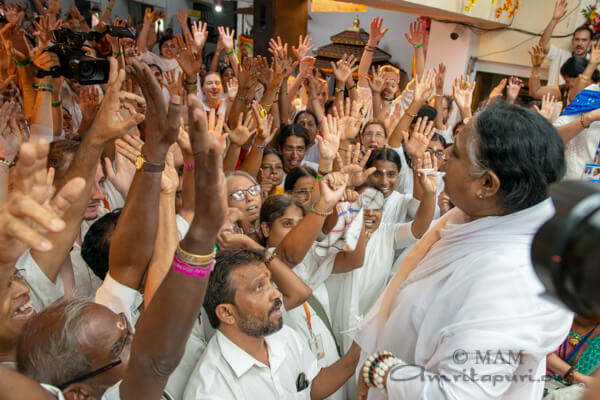 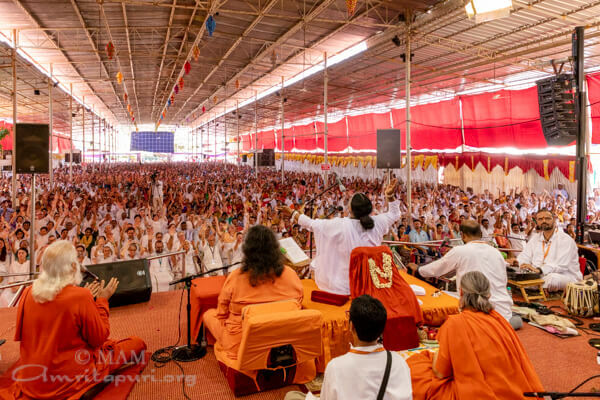 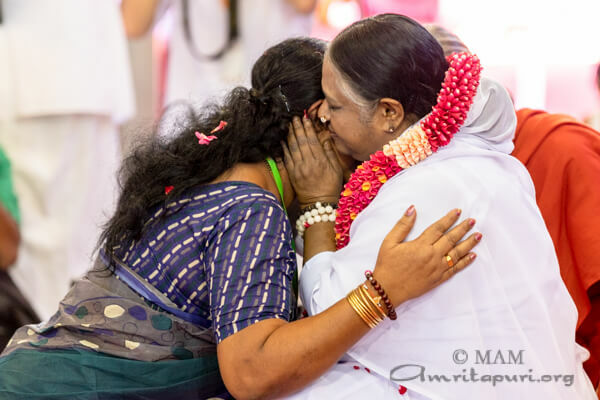 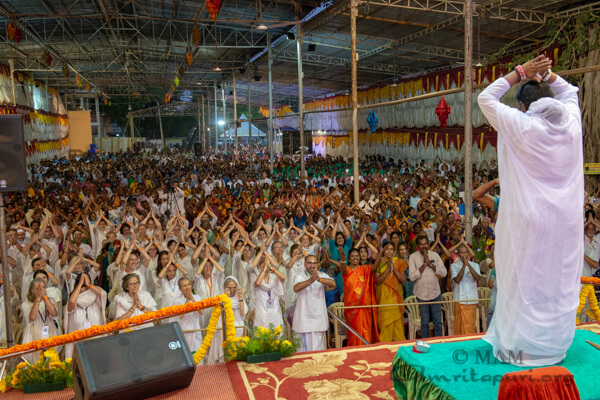 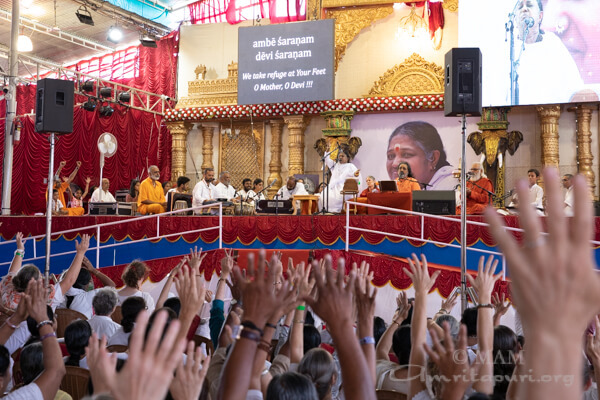 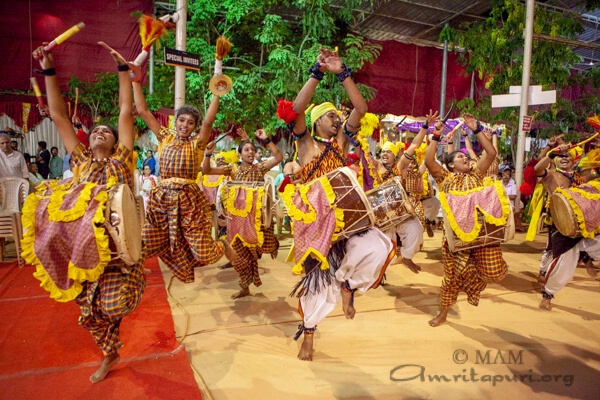 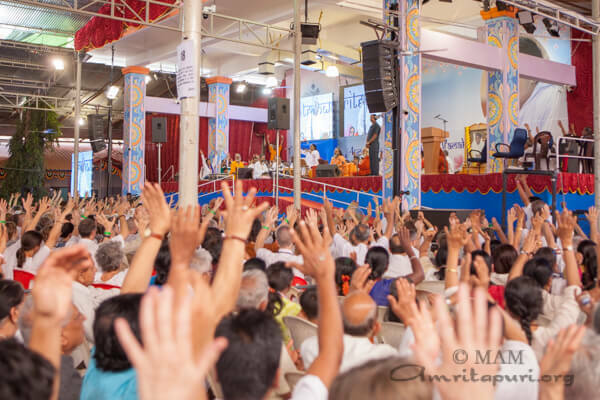 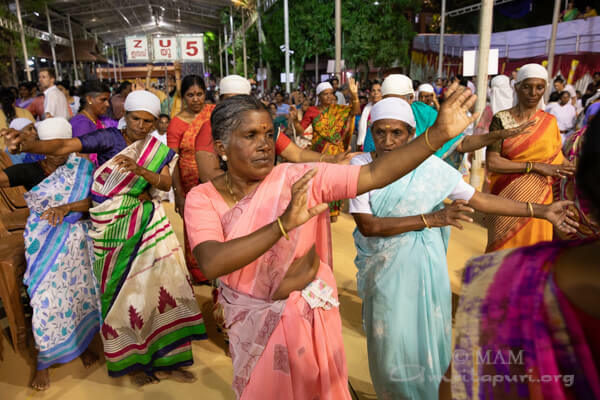 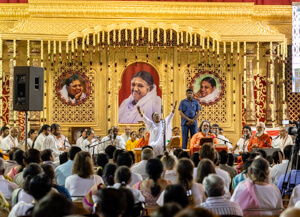 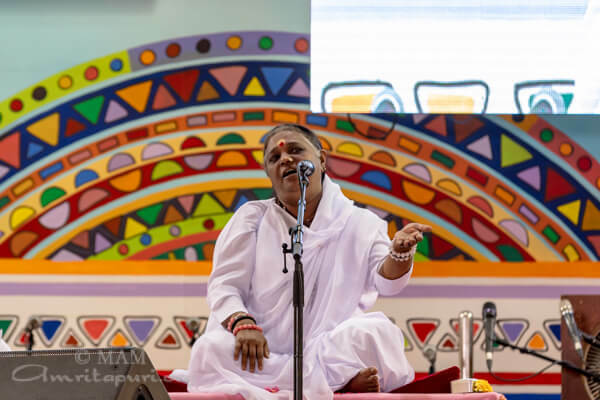 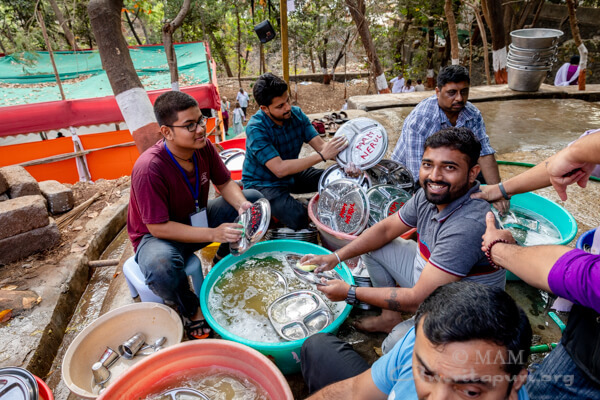 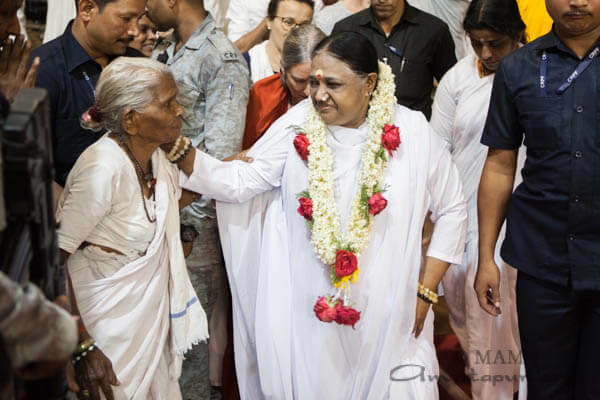 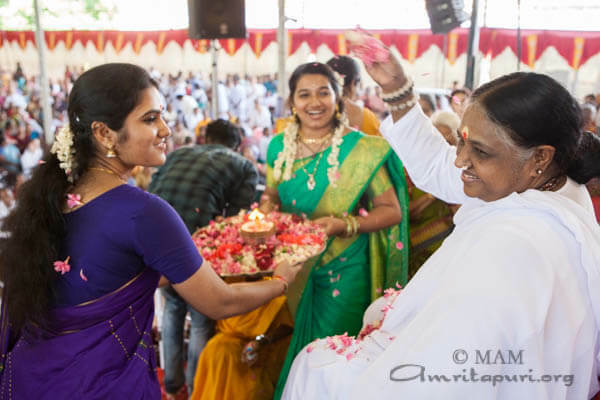 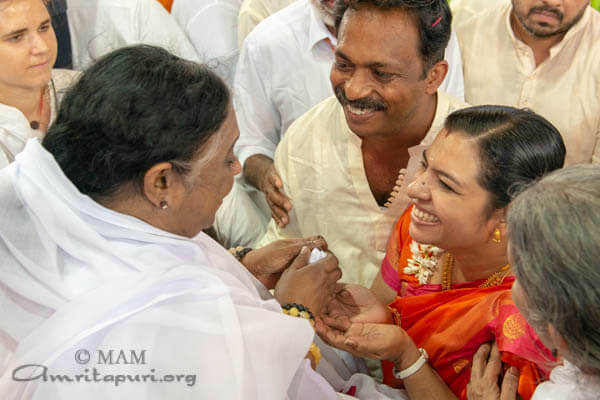 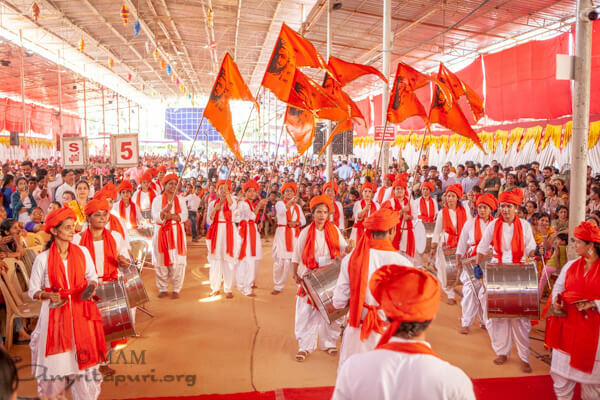 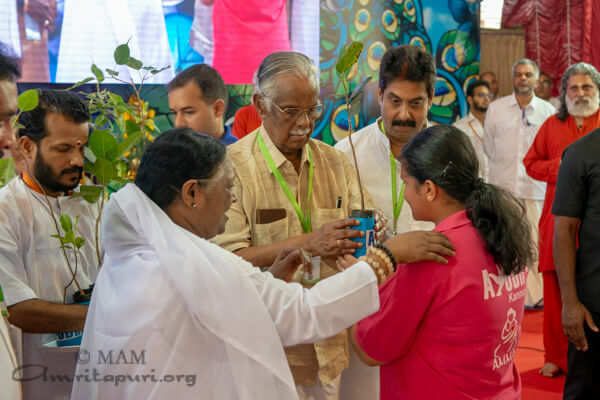 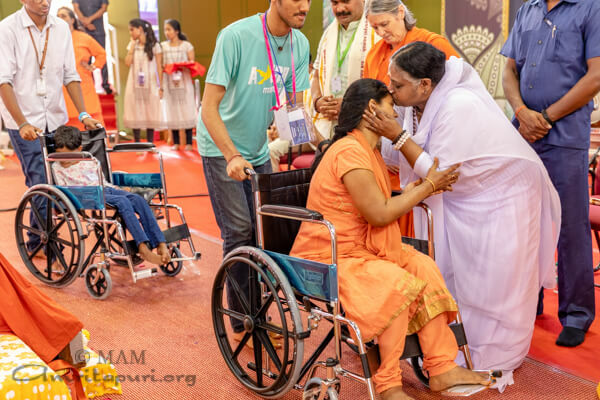 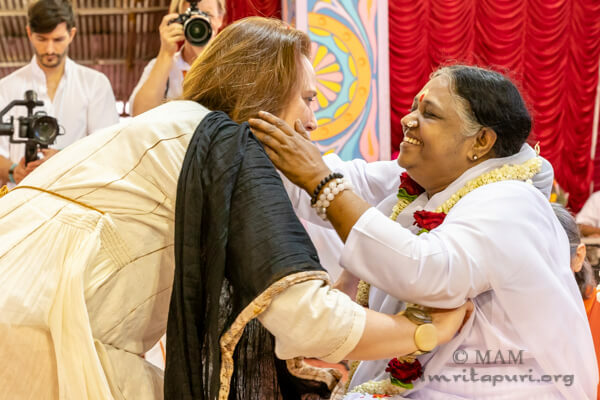 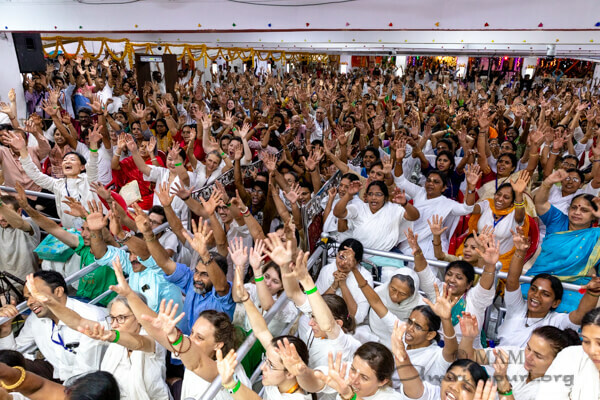 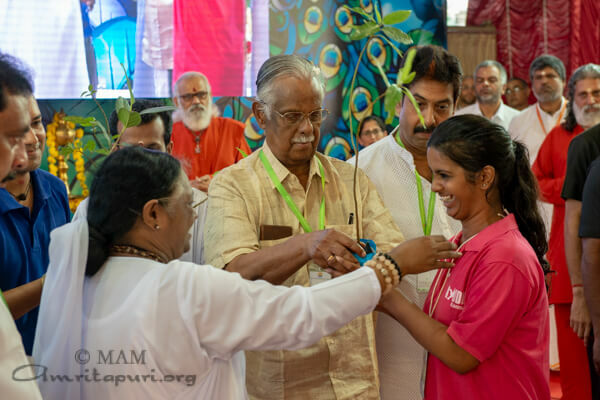 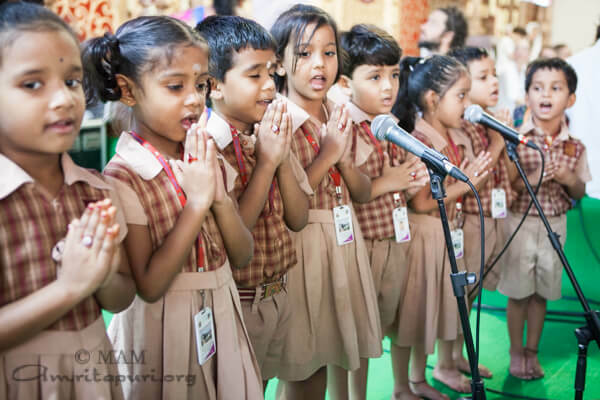 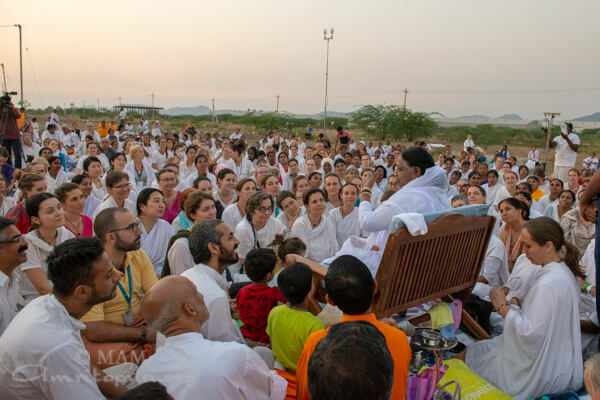 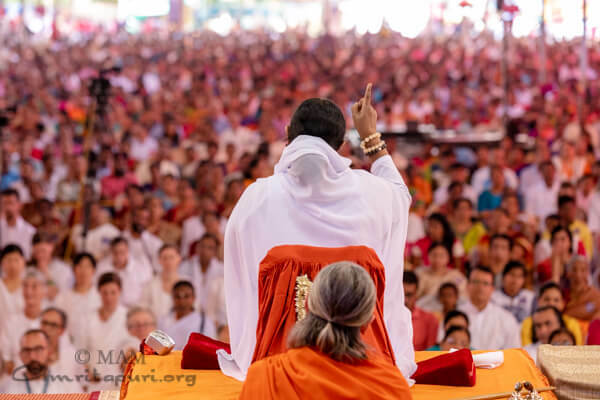 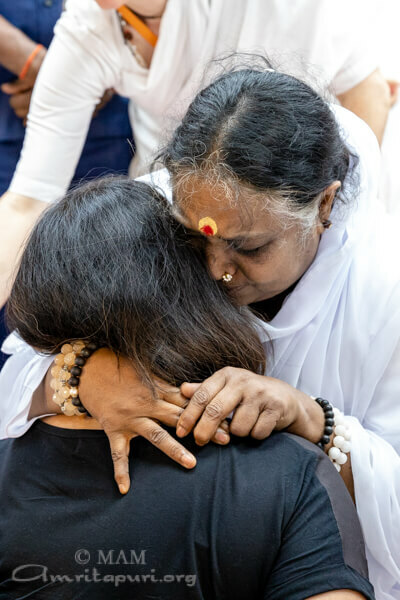 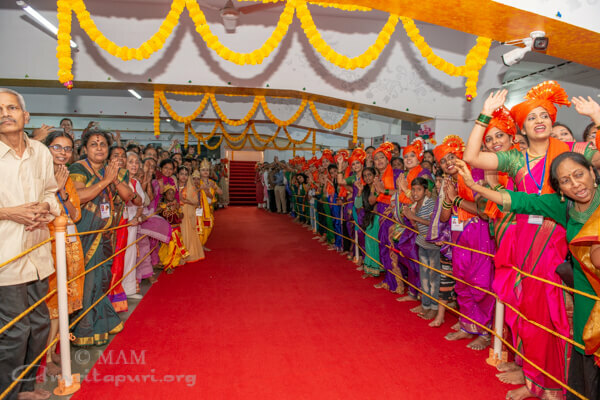 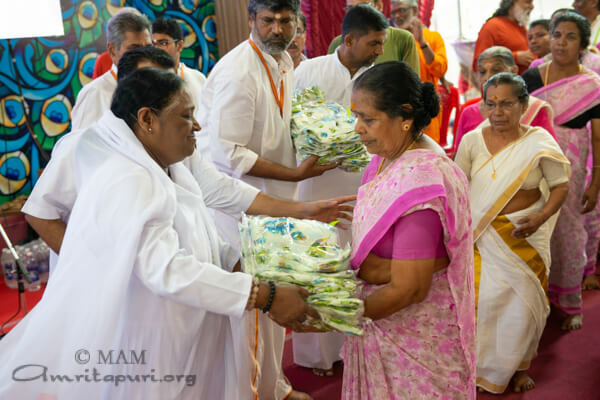 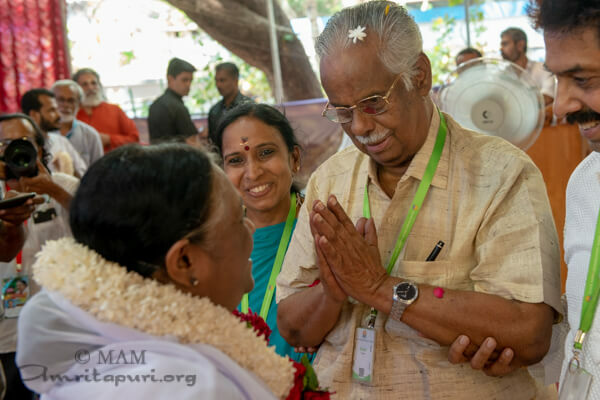 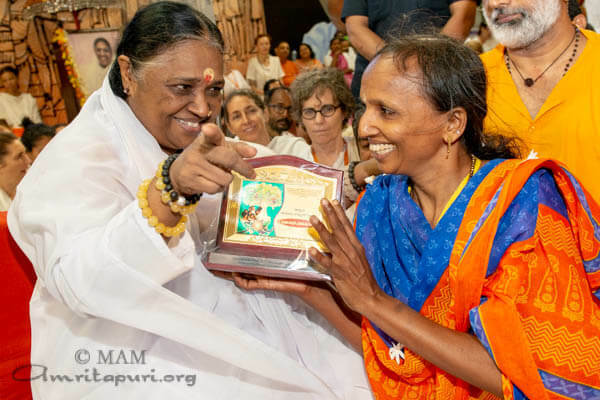 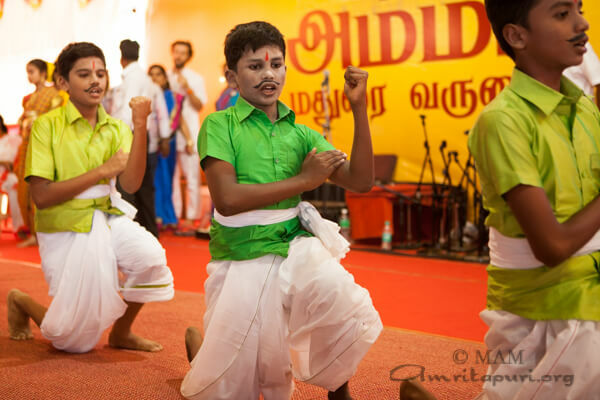 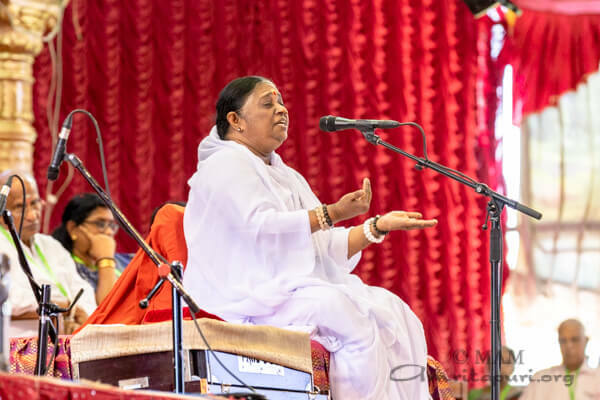 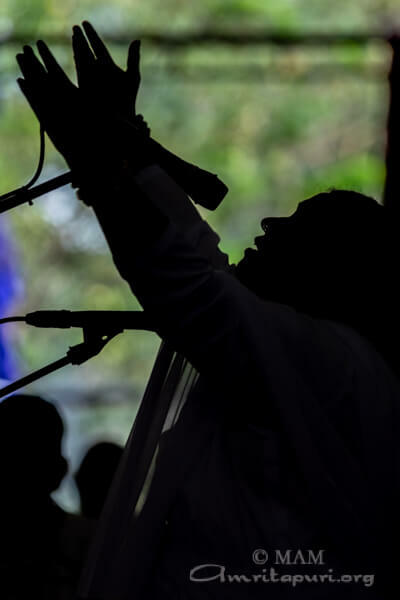 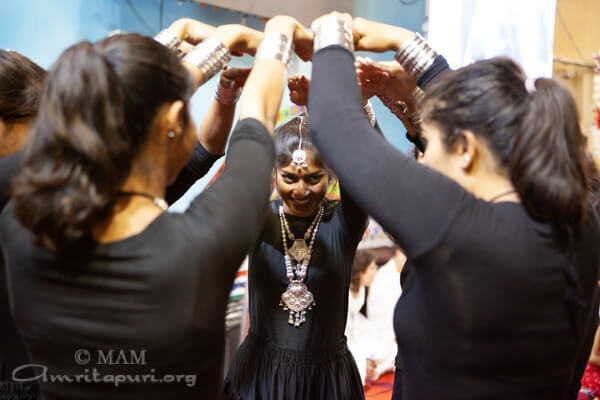 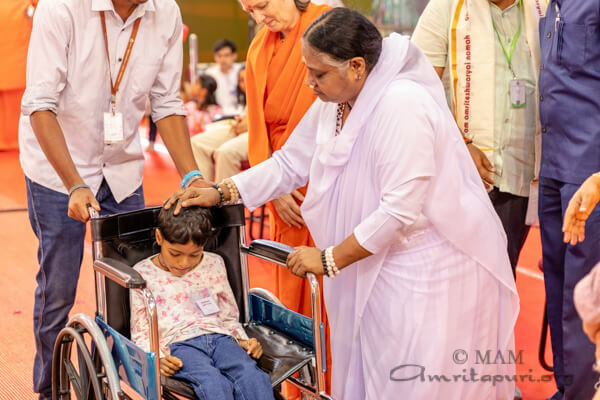 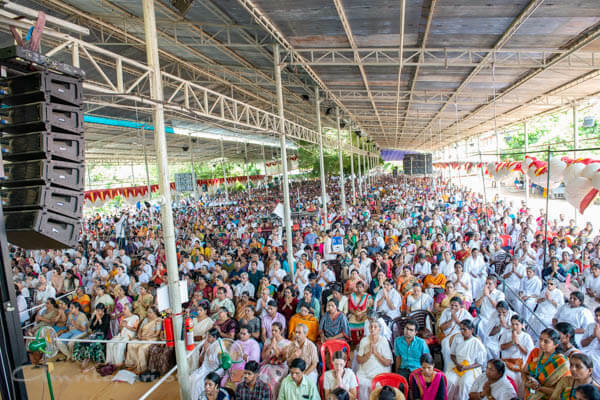 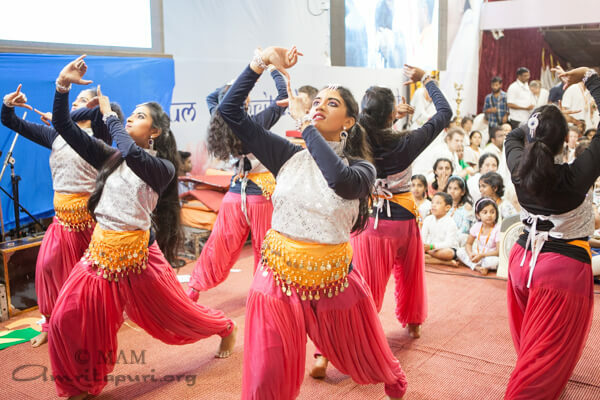 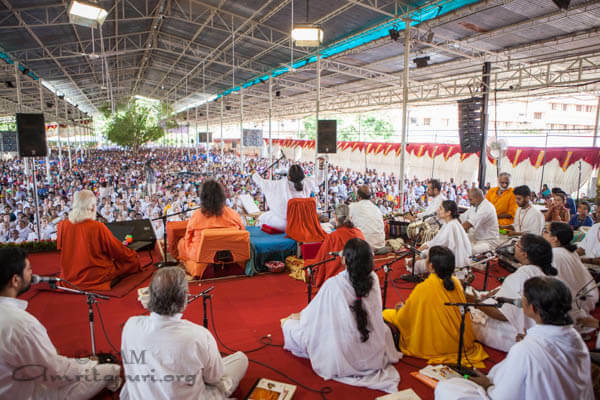 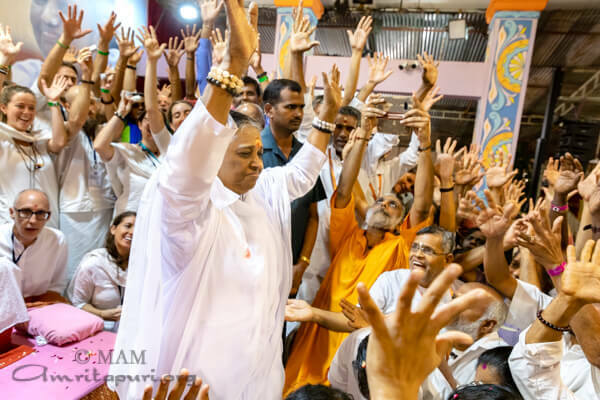 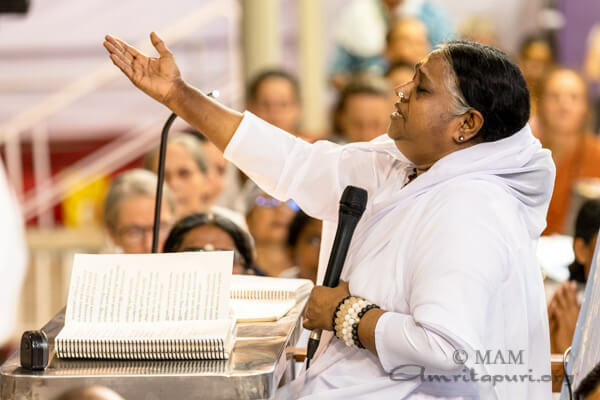 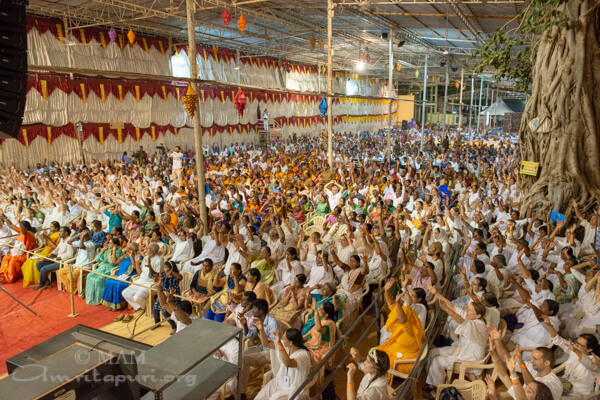 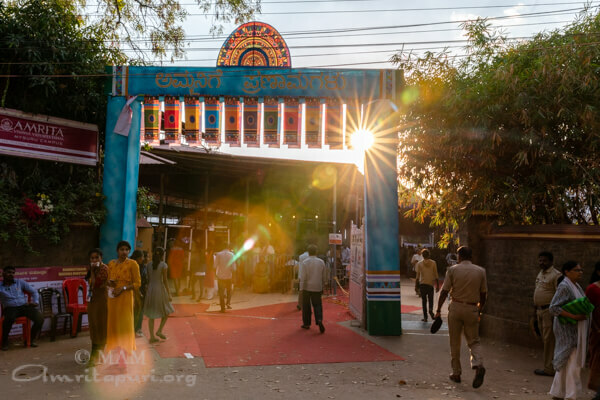 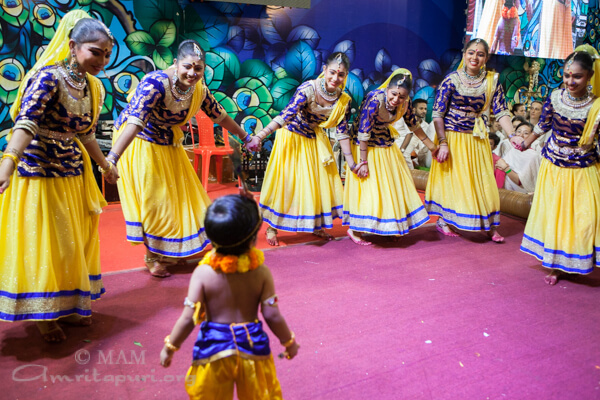 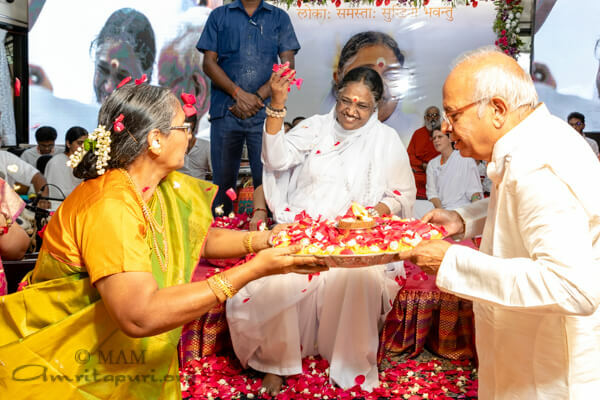 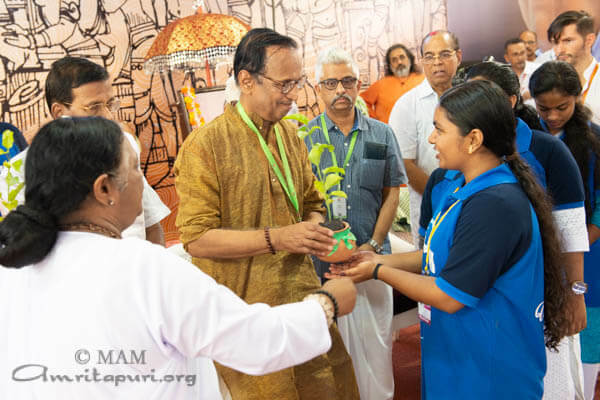 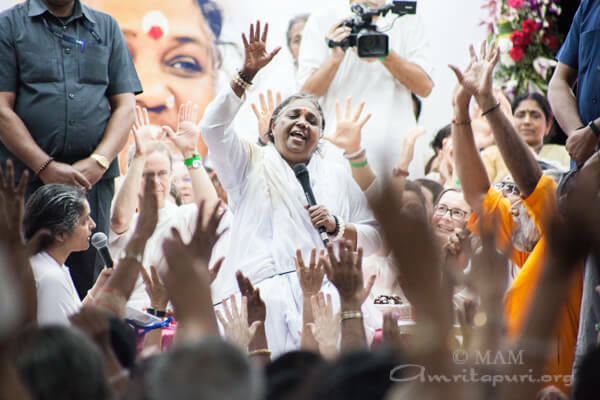 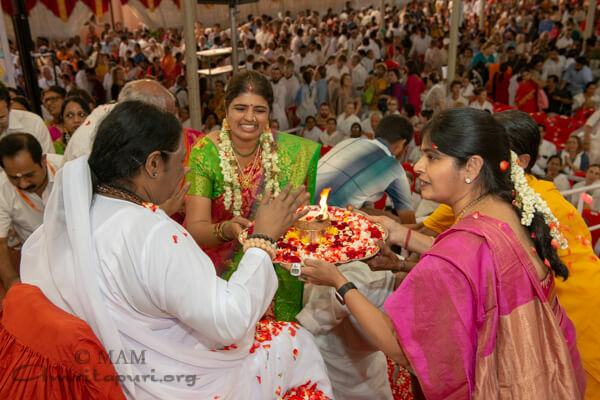 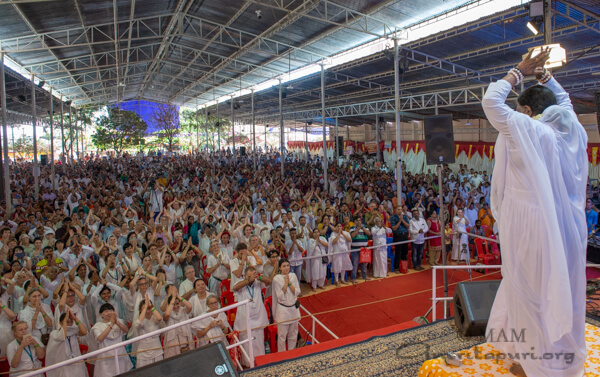 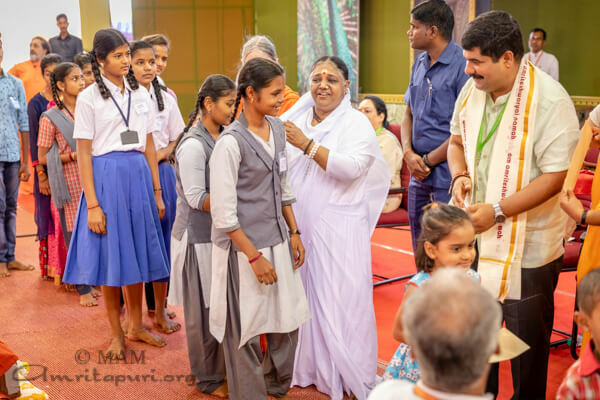 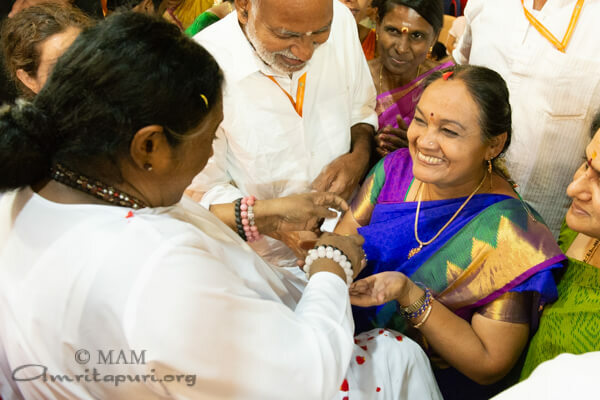 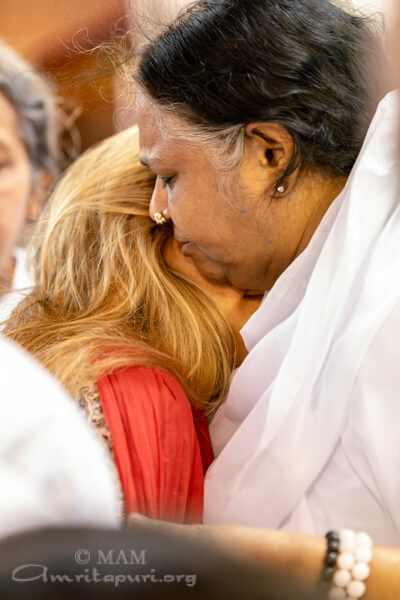 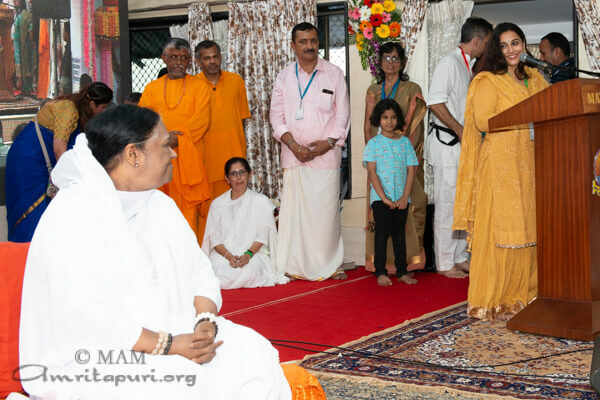 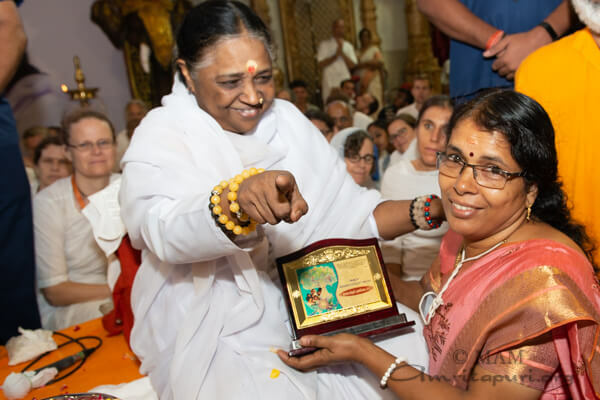 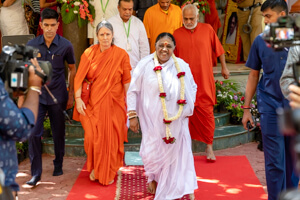 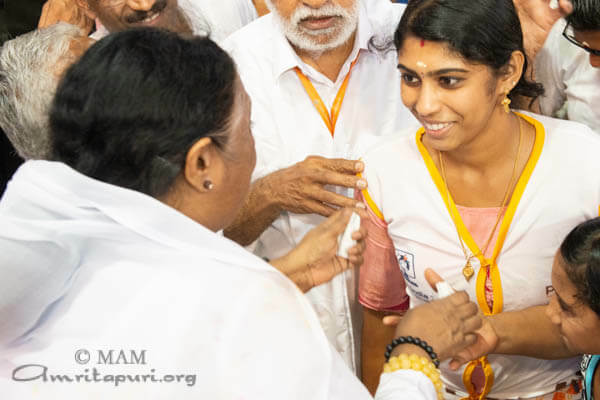 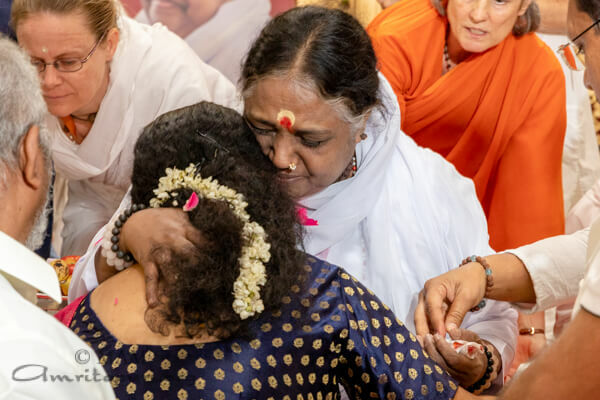 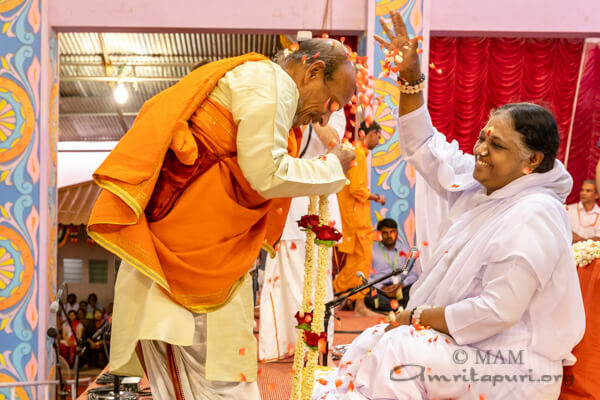 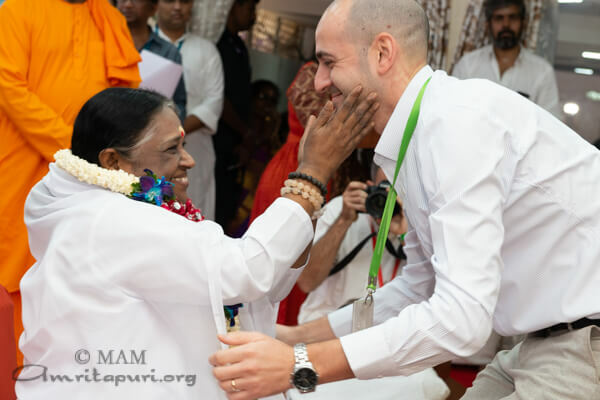 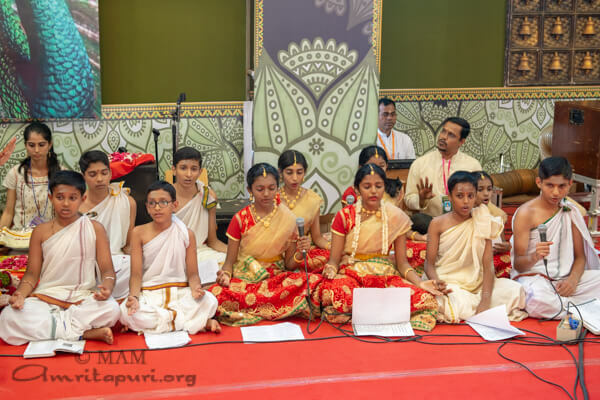 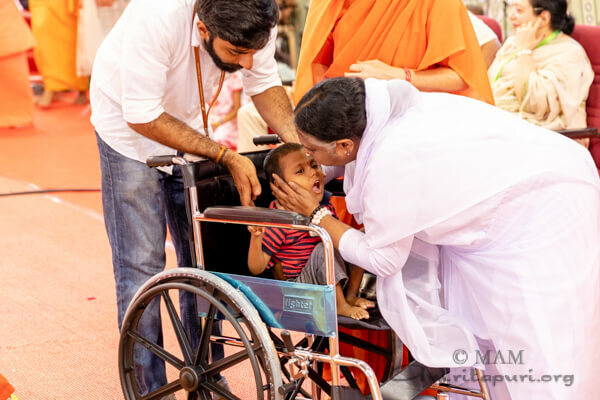 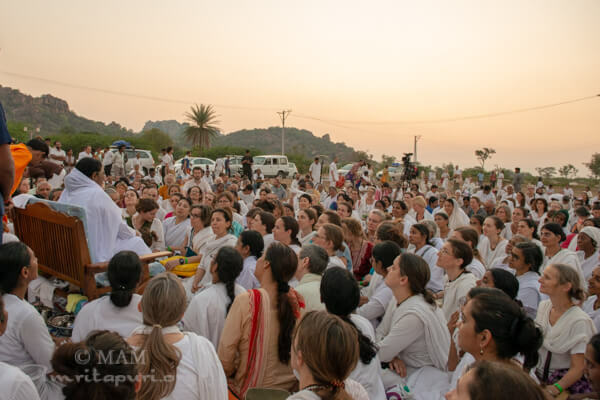 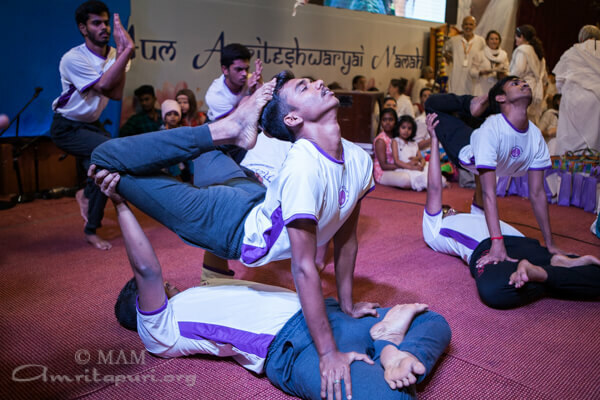 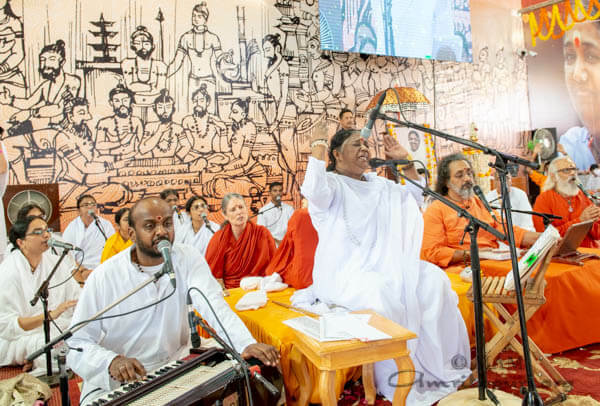 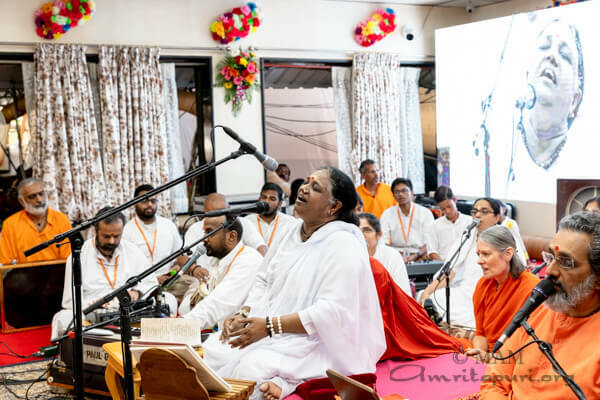 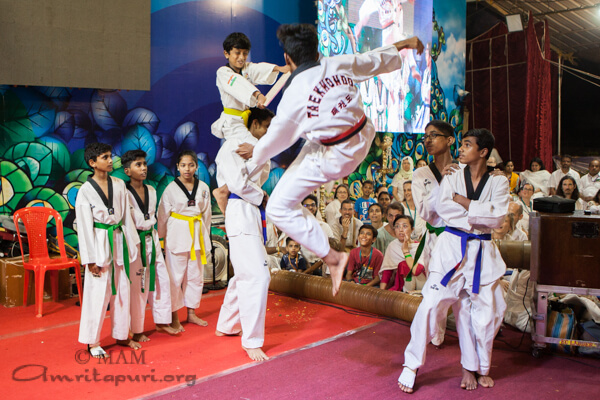 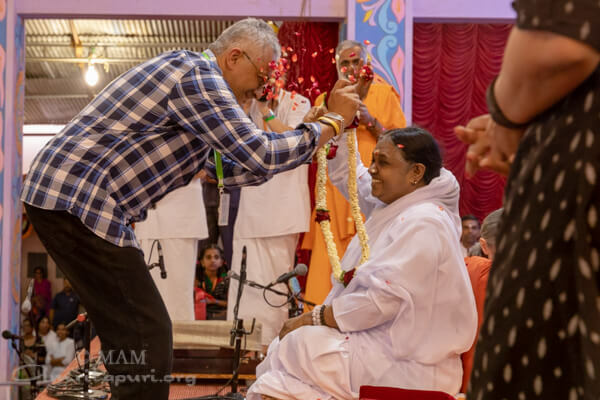 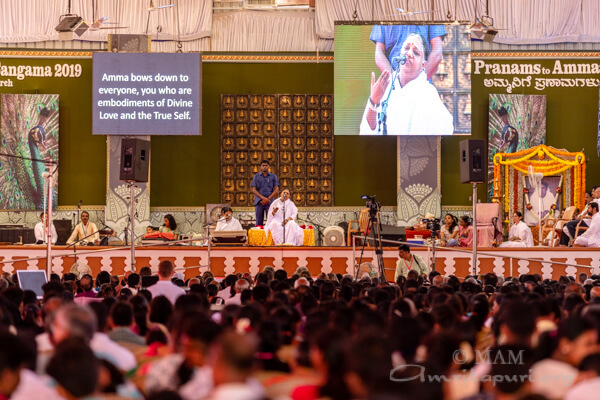 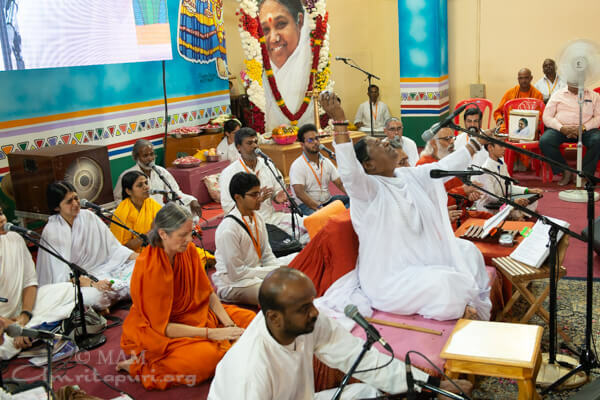 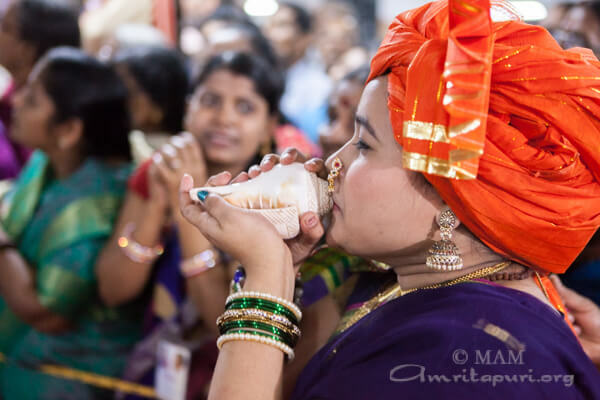 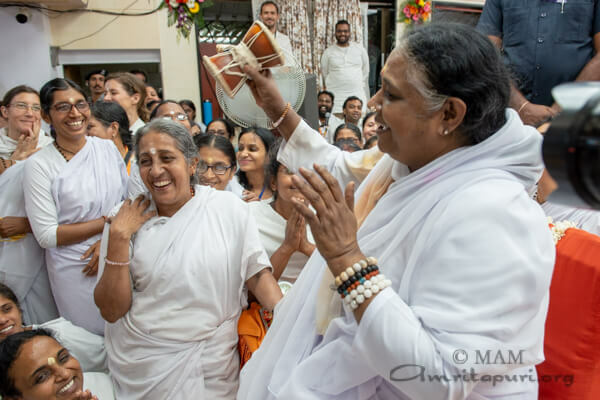 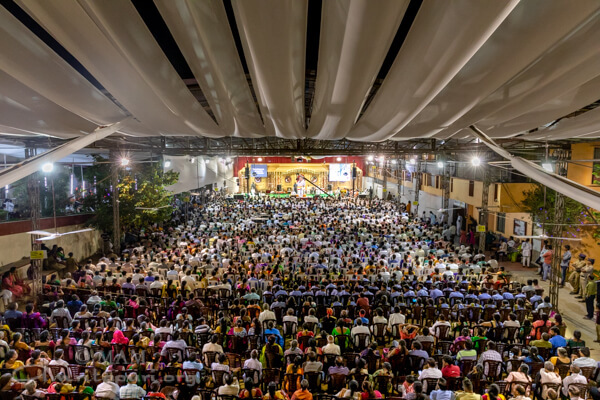 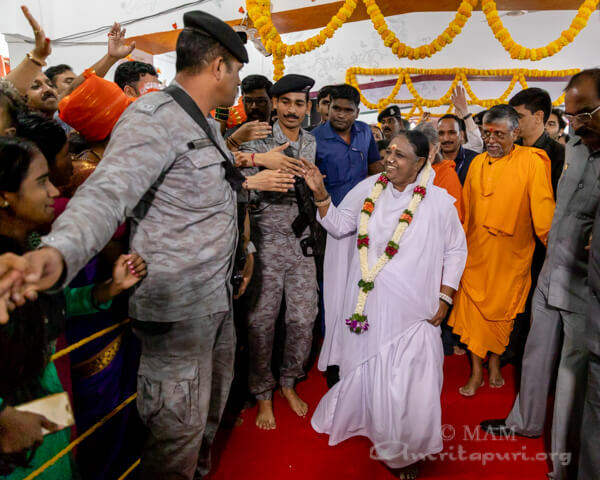 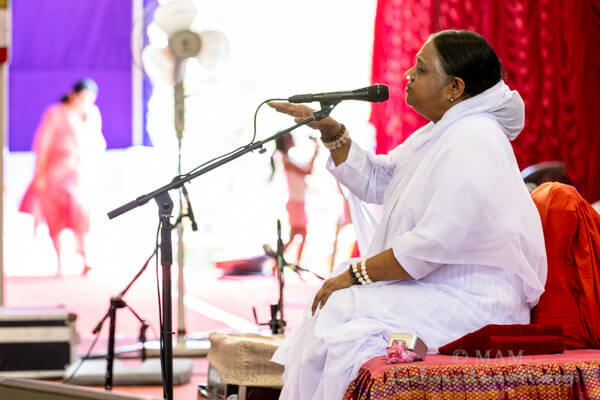 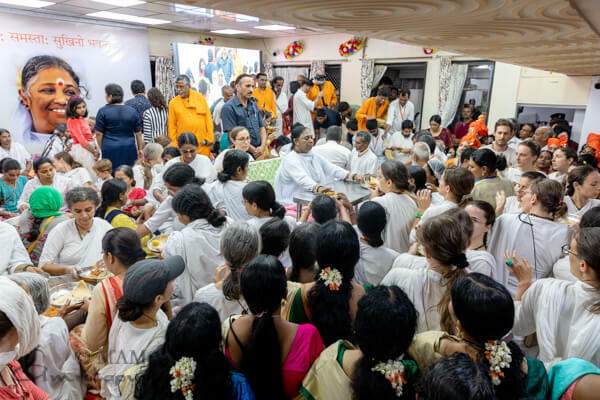 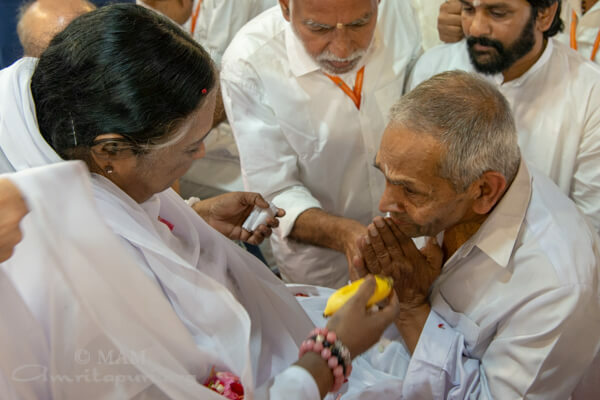 Even though it was quite late and the local devotees had been working hard to set up the program, as soon as Amma’s camper came into sight, the energy radiated as if it was early morning. 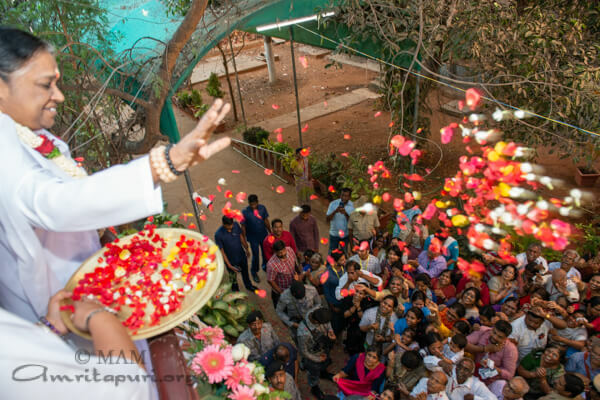 As she walked up the steps to the balcony, Amma took her time, shedding loving and joyful glances at her Hyderabad children along the way. 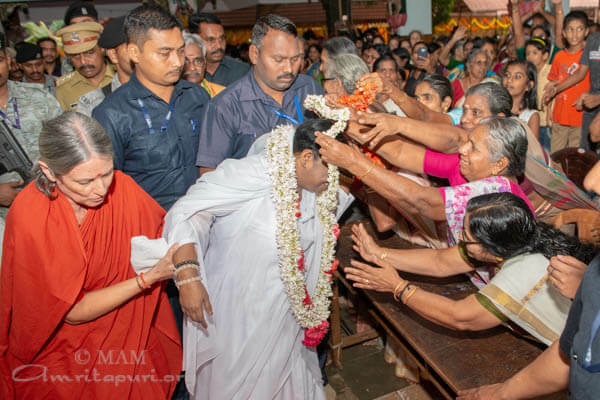 Many of them had waited almost a year to see Amma again. The opening function was attended by many dignitaries. 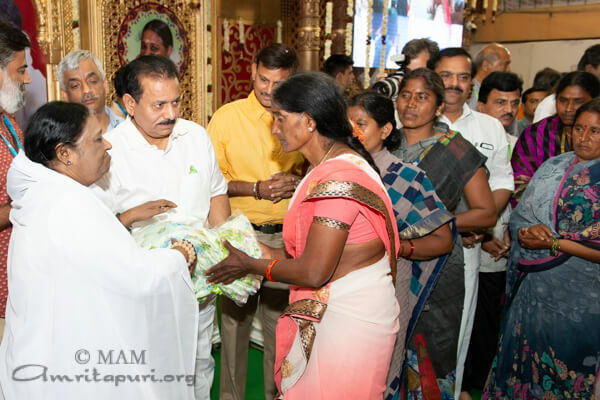 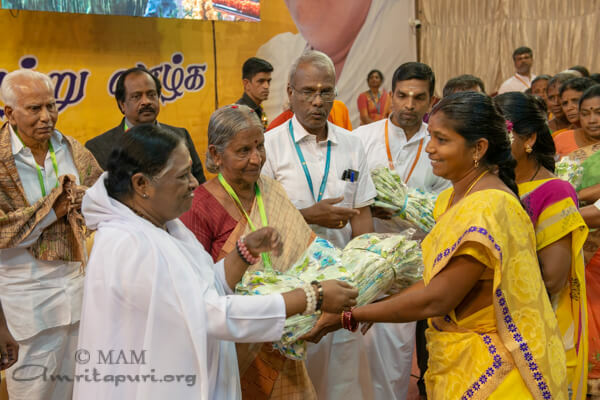 Amma also distributed sarees to the women of AmritaSREE Self-Help groups. 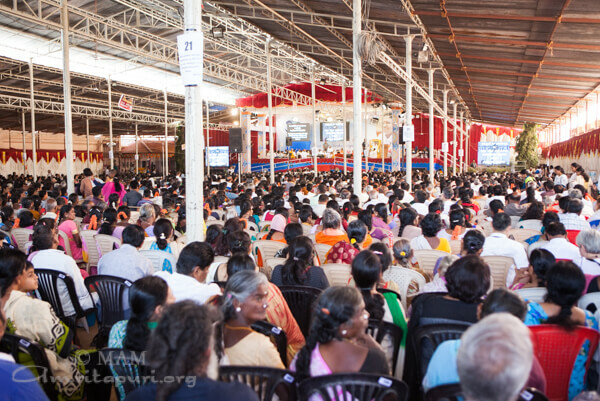 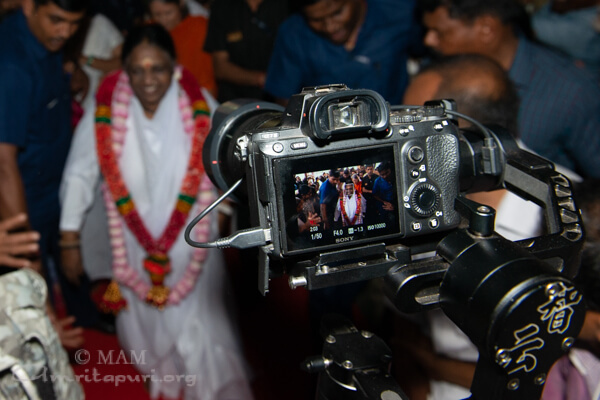 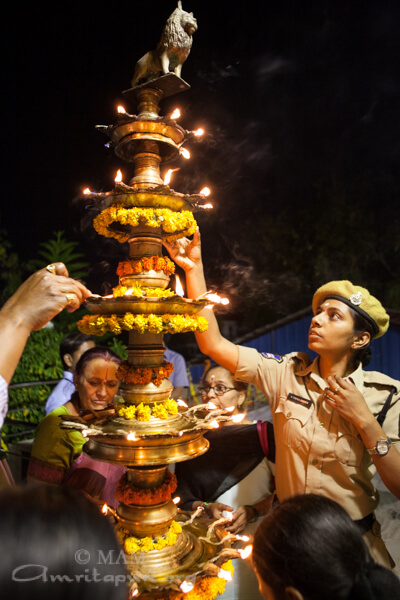 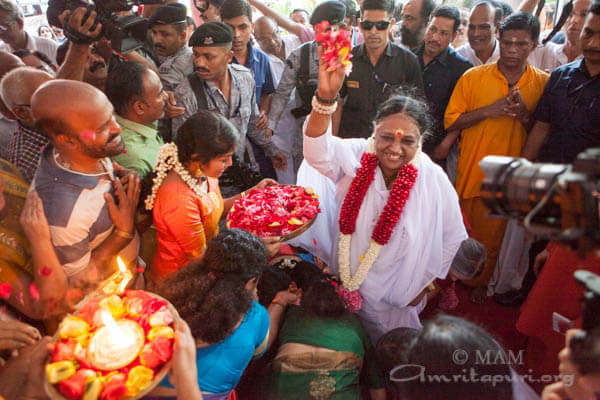 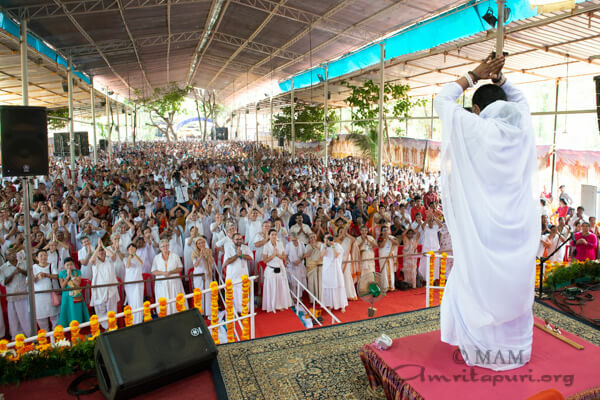 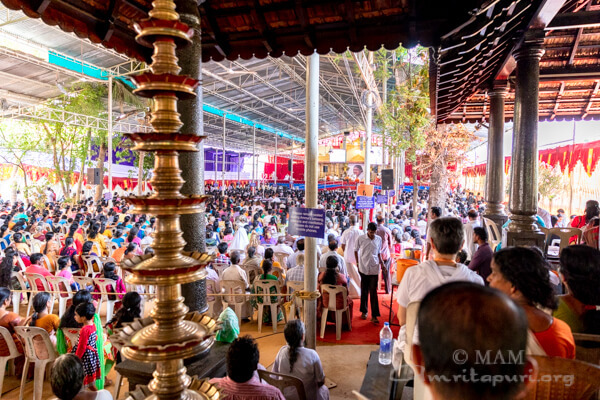 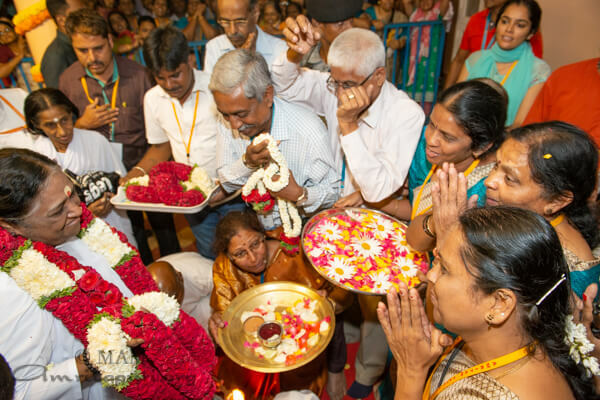 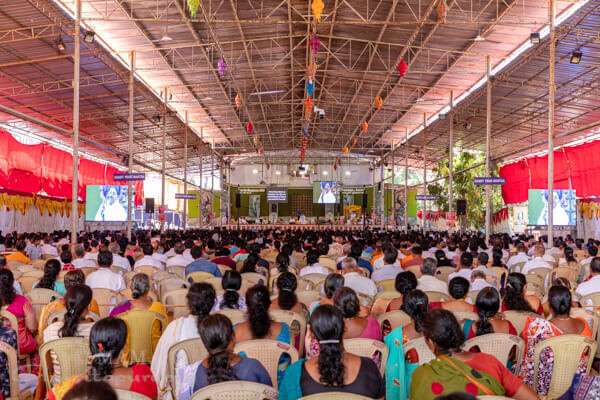 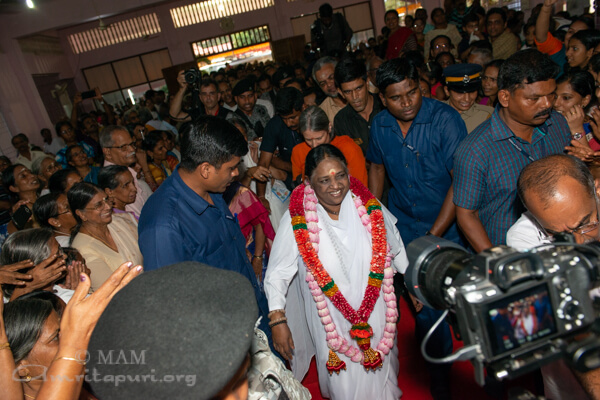 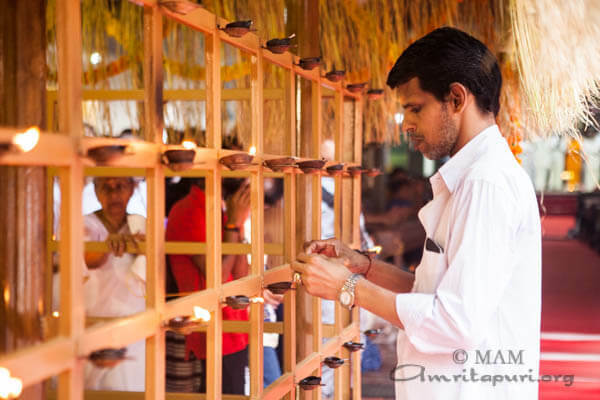 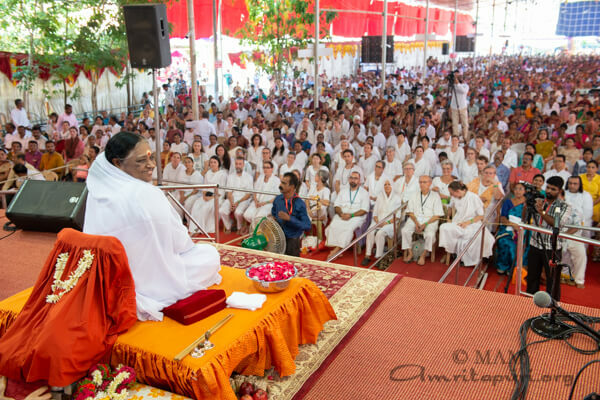 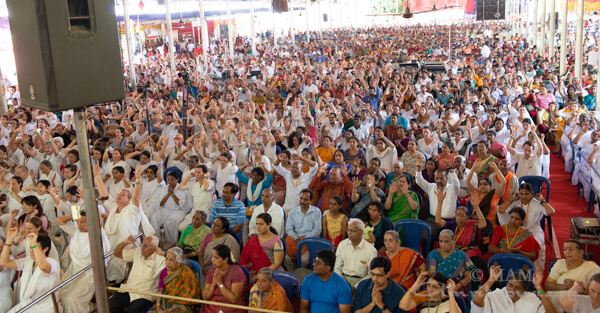 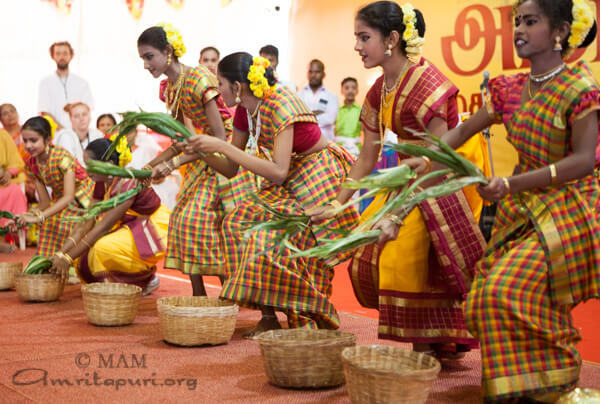 Among the many who came for Amma’s darshan were hundreds of people from the nearby villages. 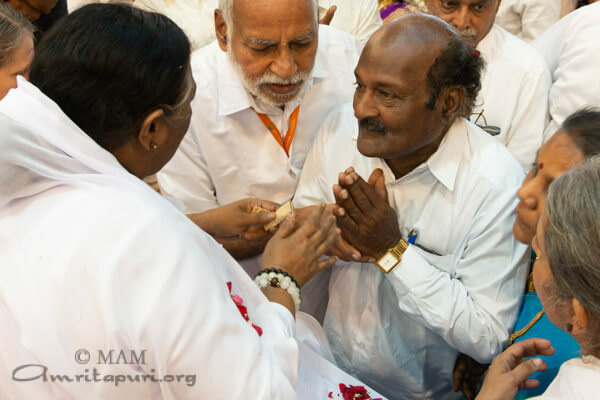 Most of them had only heard of Amma and were meeting her for the first time. 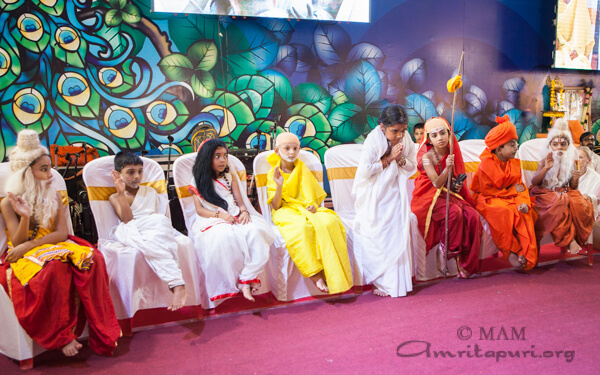 Their innocent and devoted attitude was an inspiration to all. 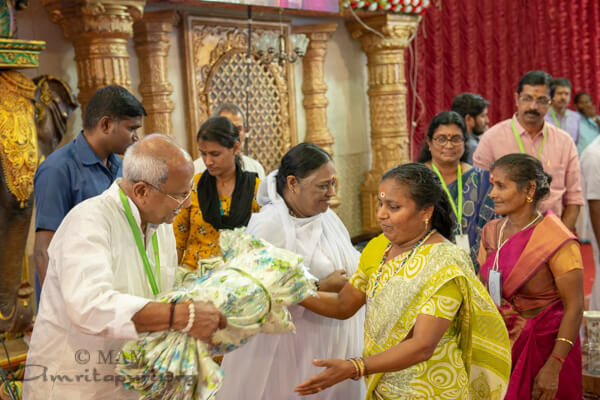 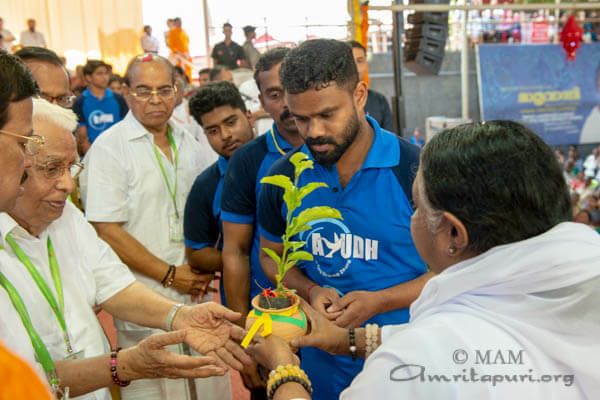 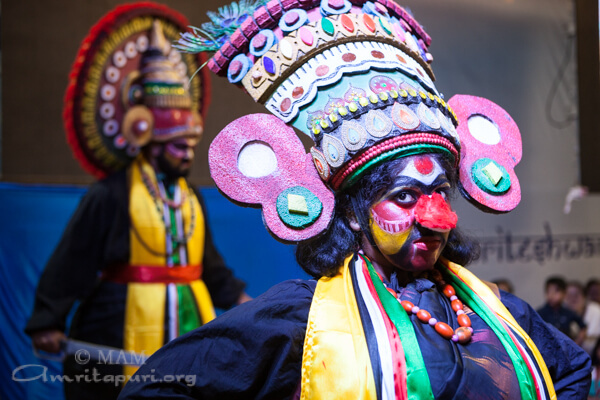 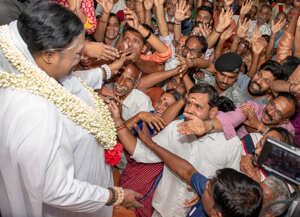 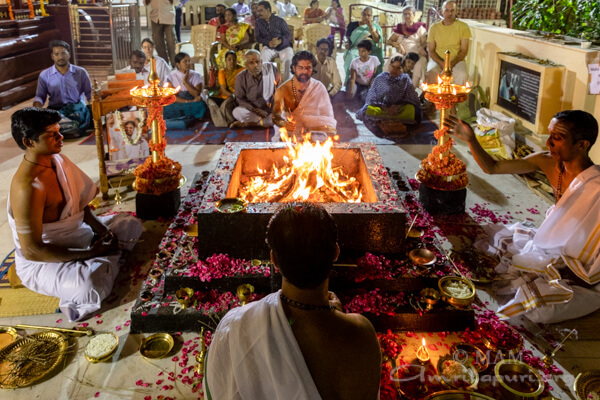 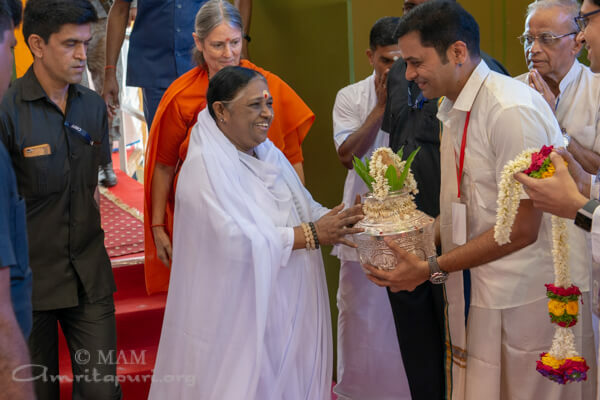 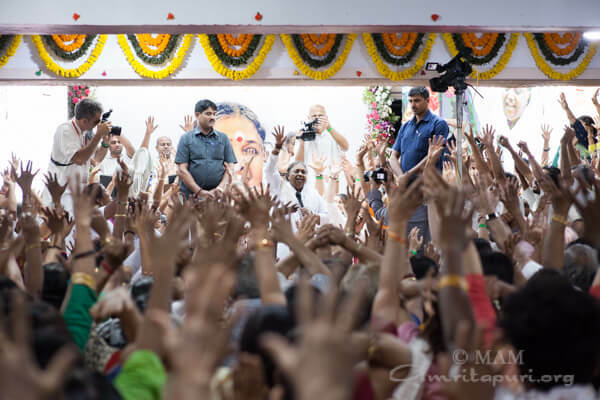 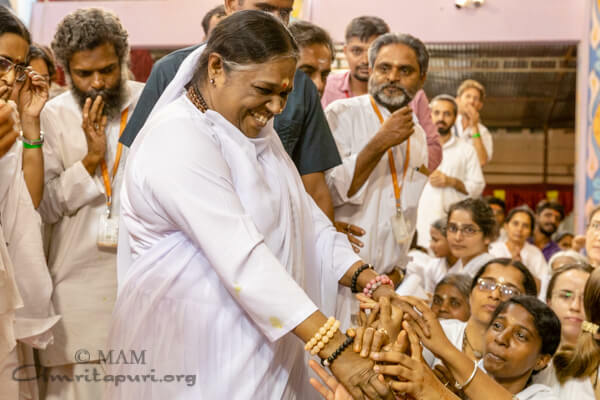 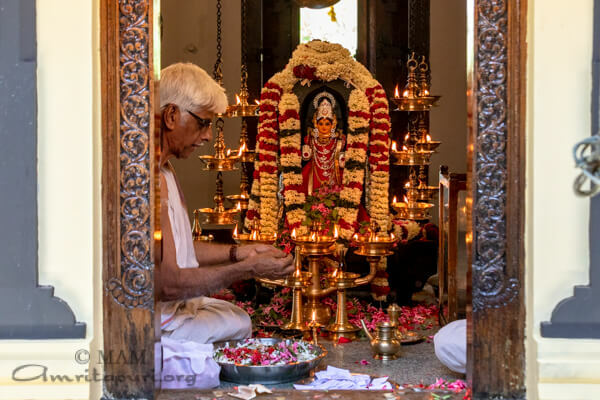 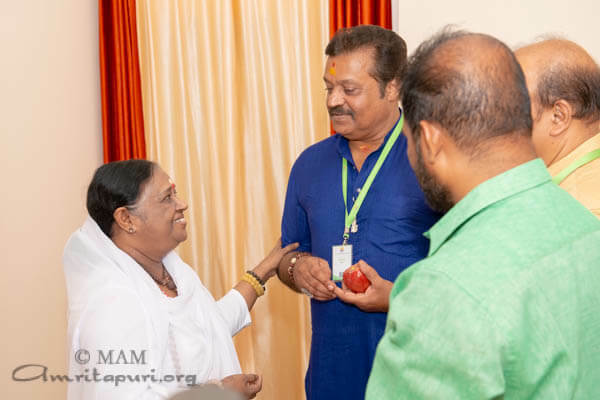 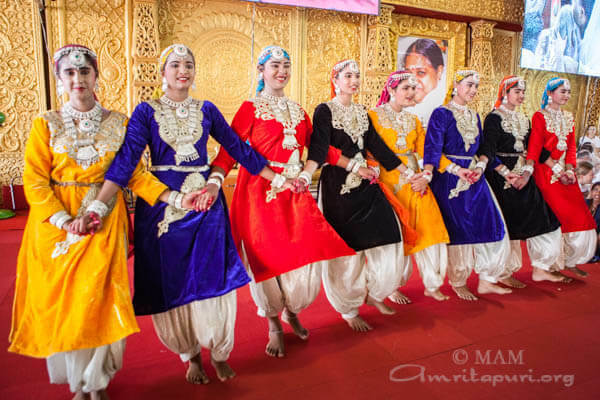 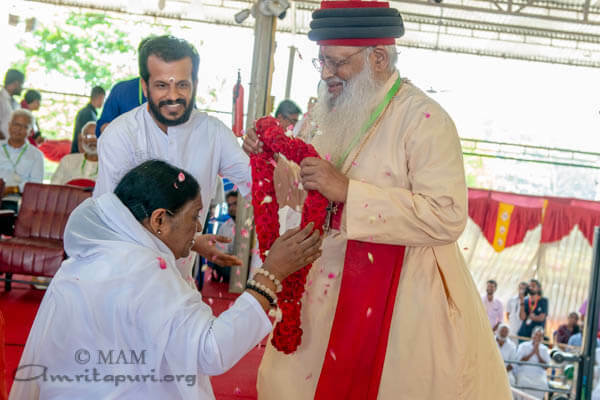 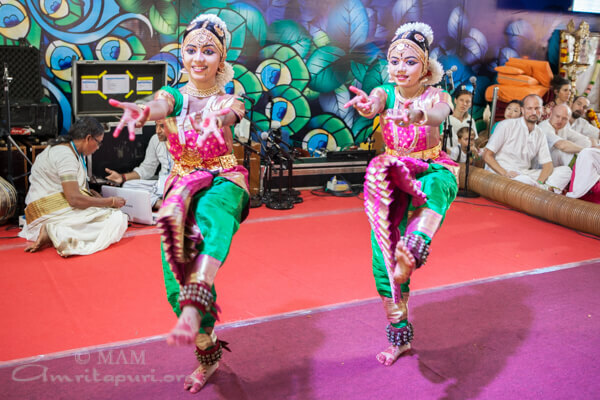 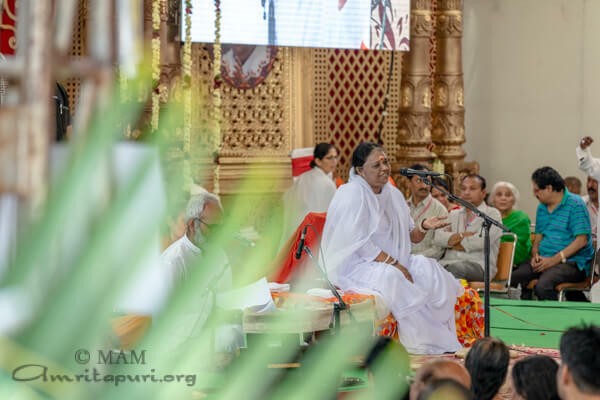 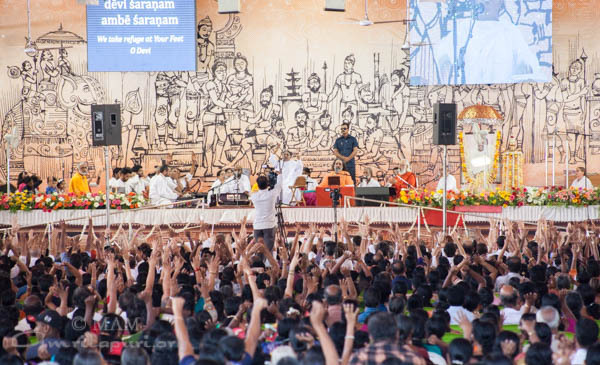 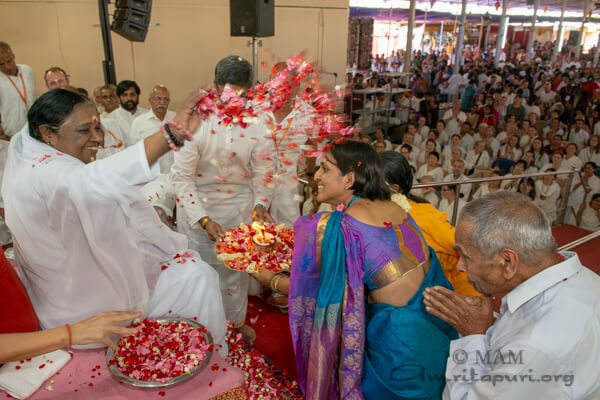 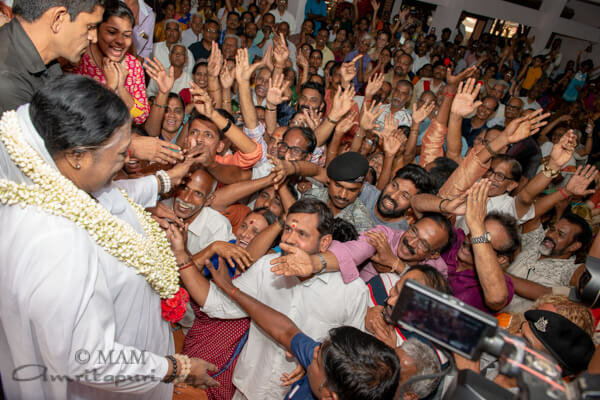 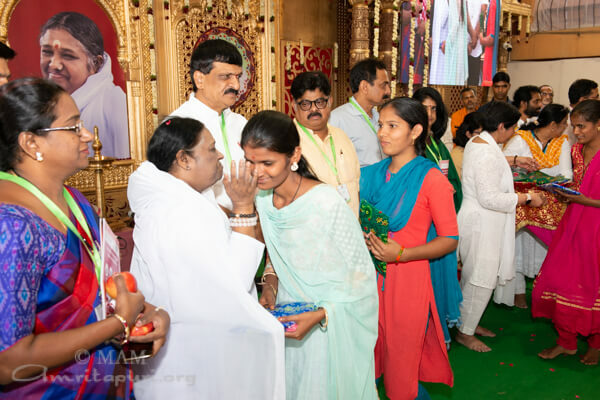 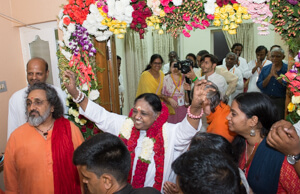 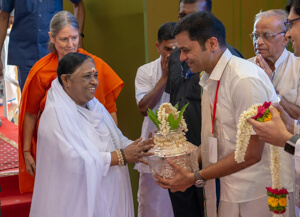 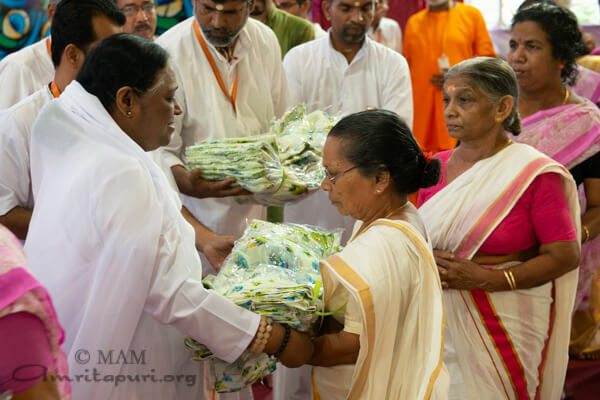 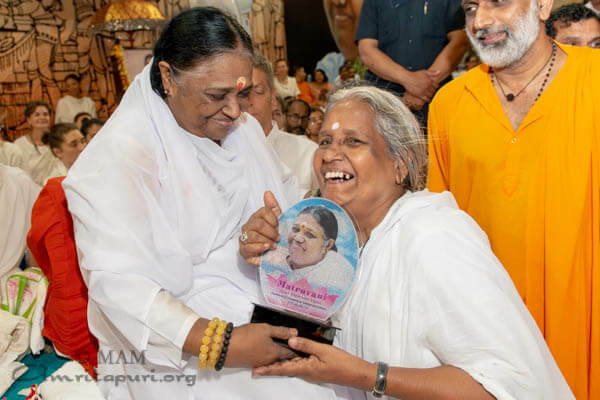 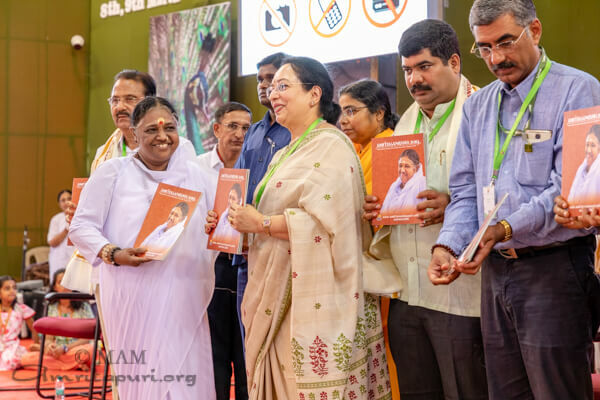 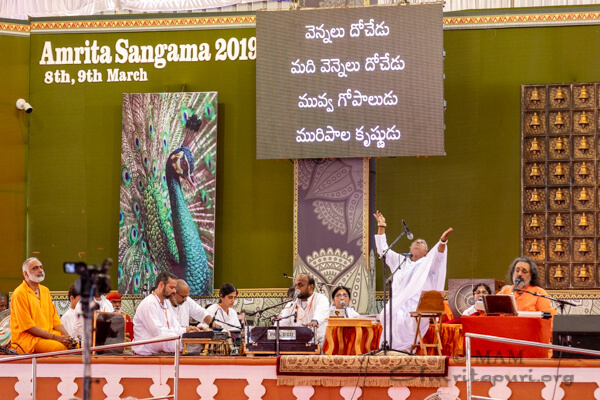 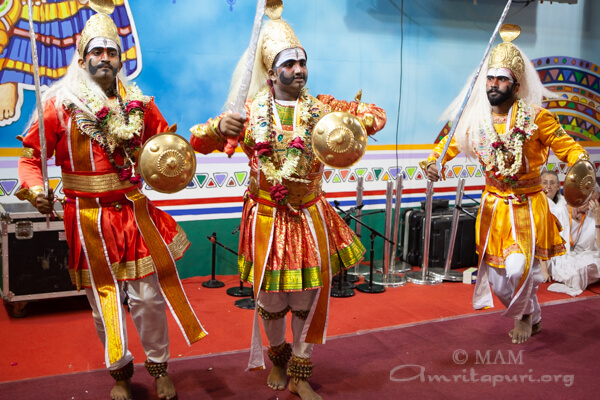 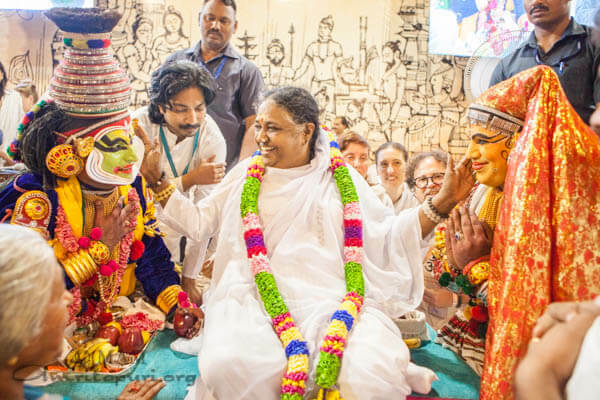 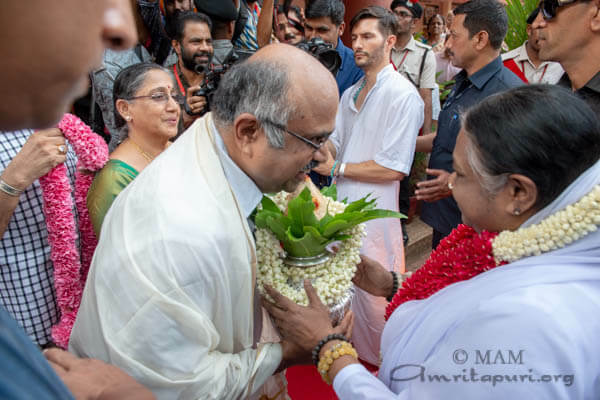 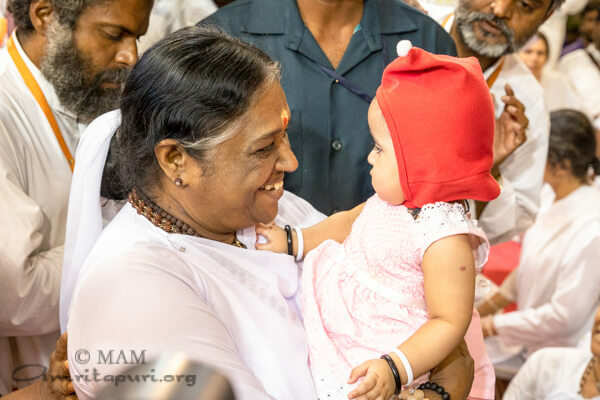 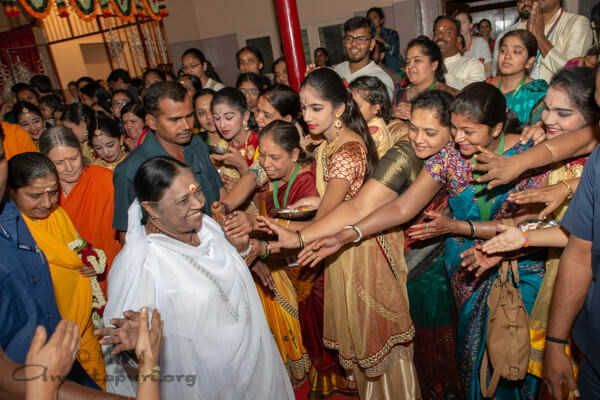 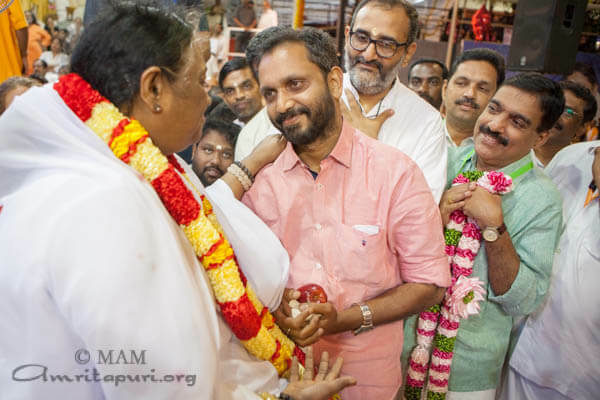 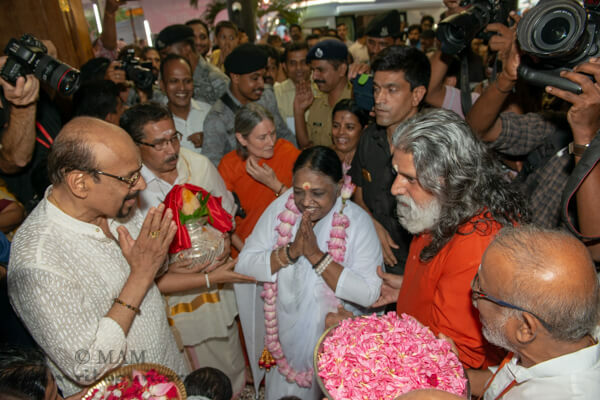 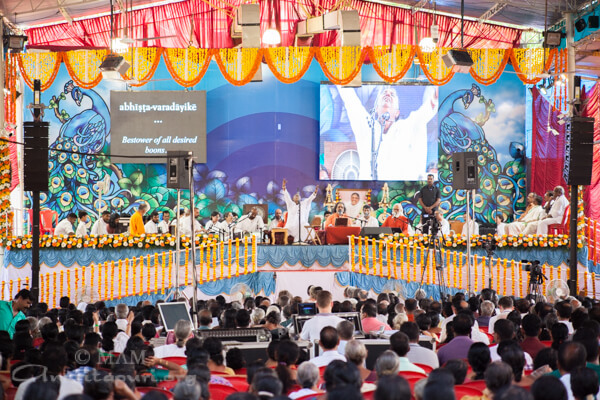 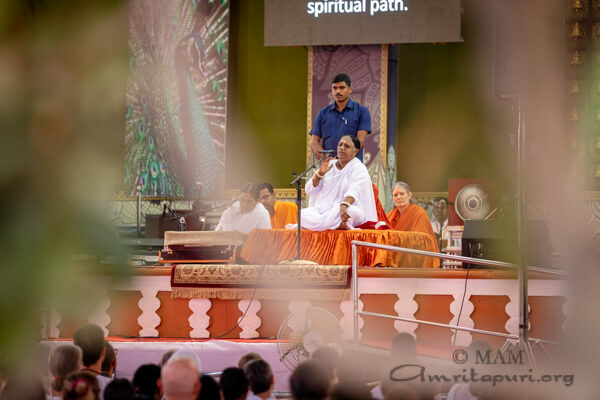 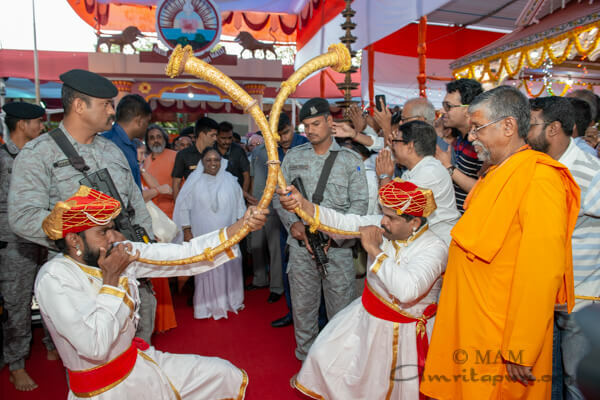 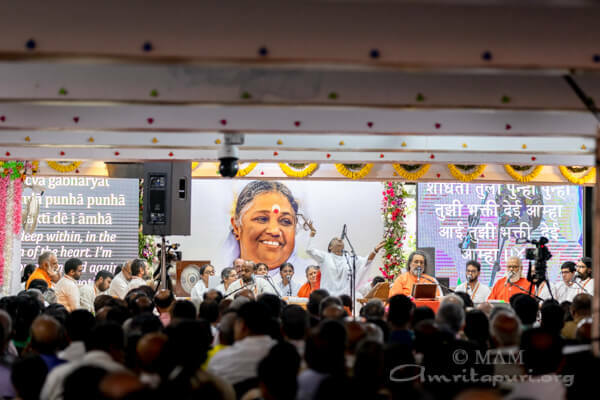 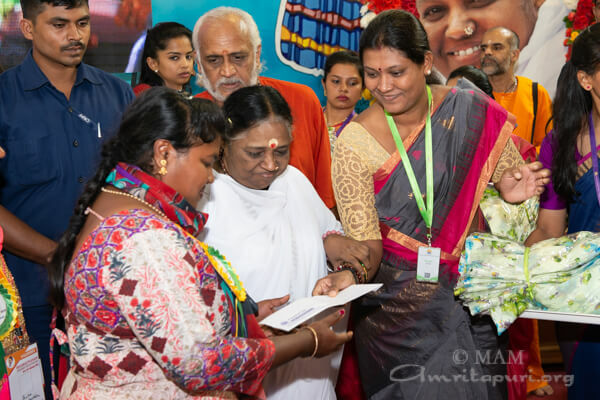 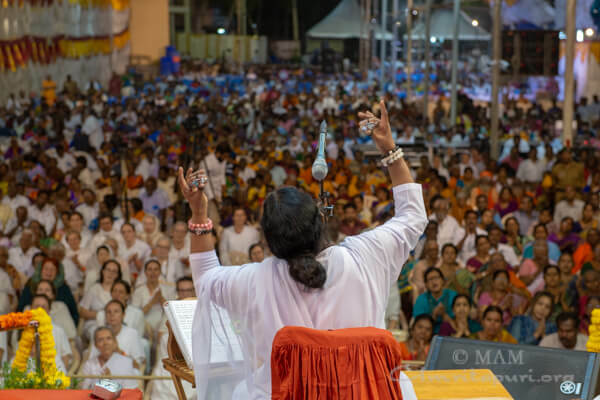 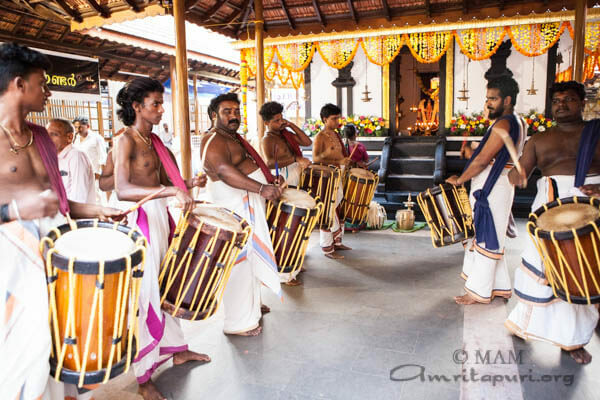 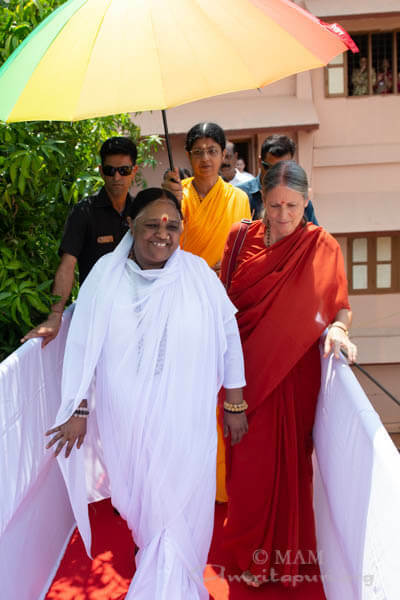 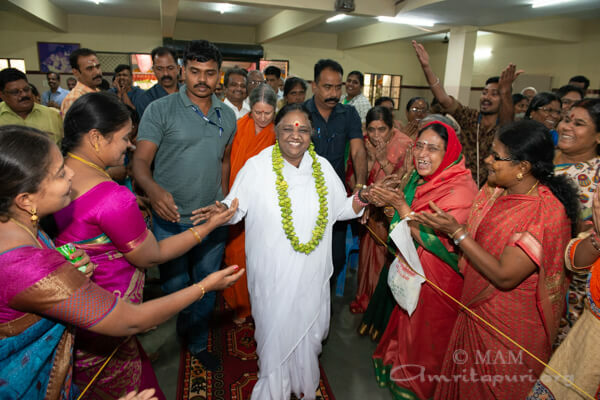 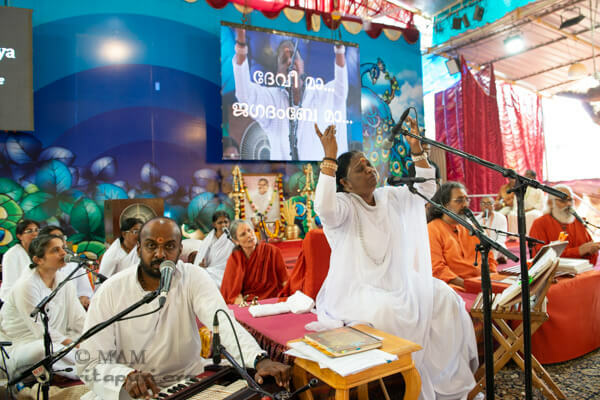 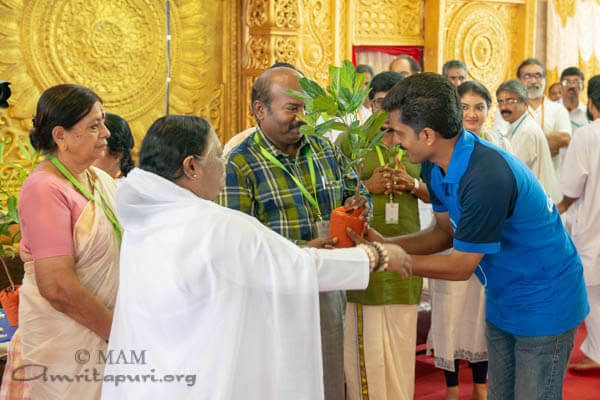 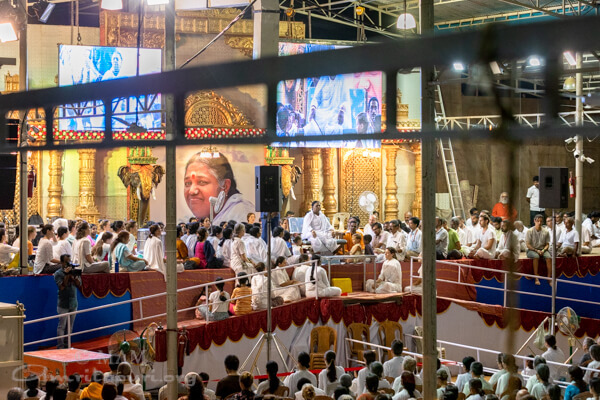 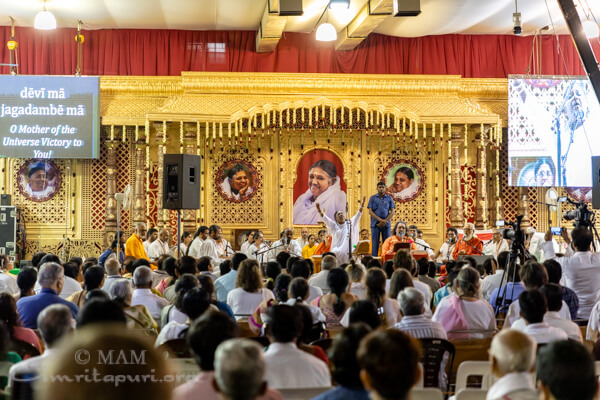 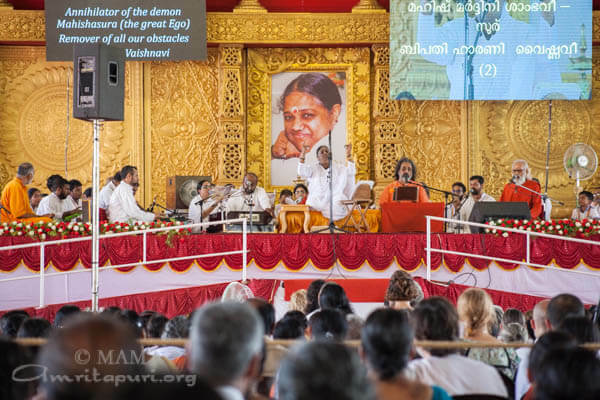 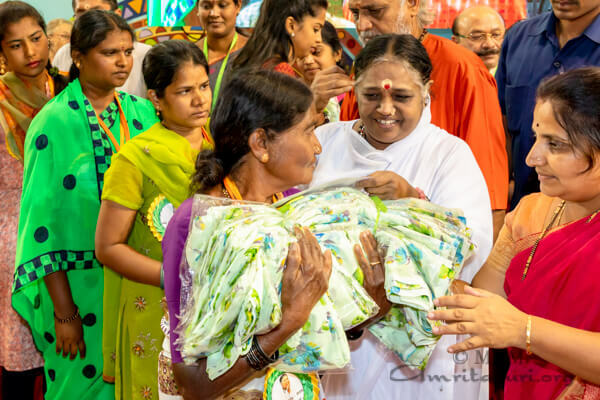 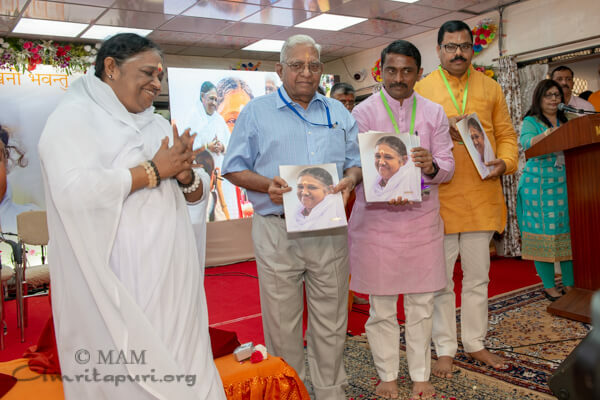 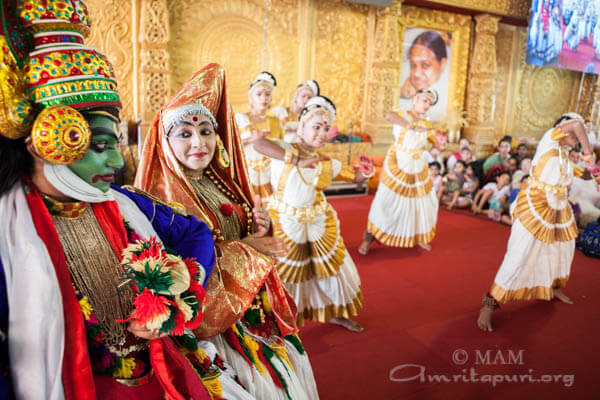 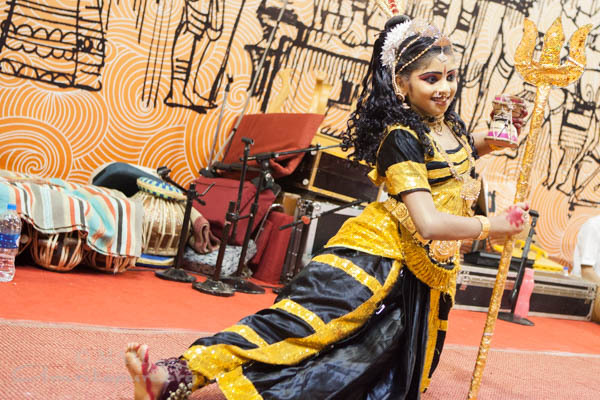 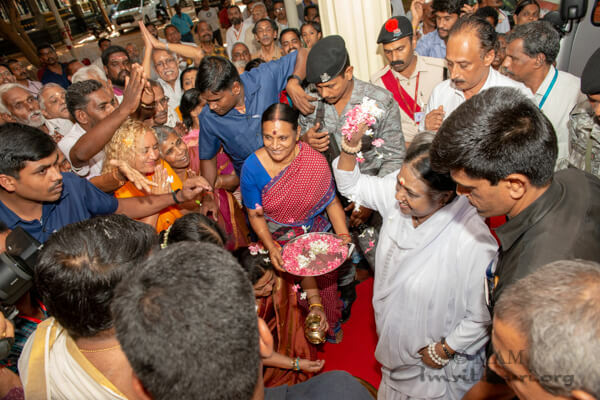 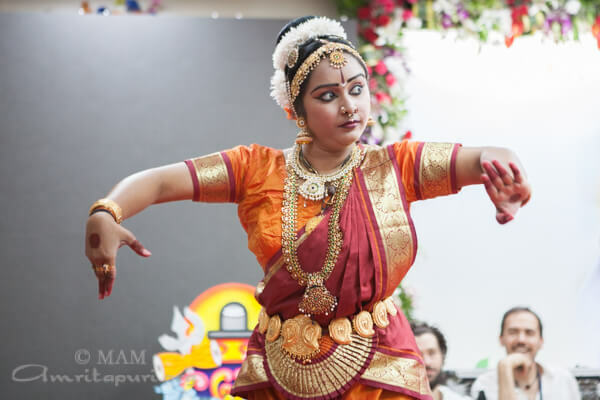 The two-day program finished around 2 in the morning and soon Amma’s sacred caravan was on its way to the next stop of this Bharata Yatra: Poona. 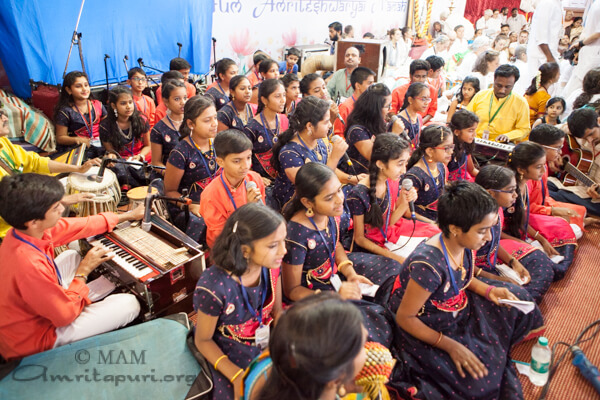 Amma always makes sure her camper drives along with the tour busses, even when the journey is 20-hours long. 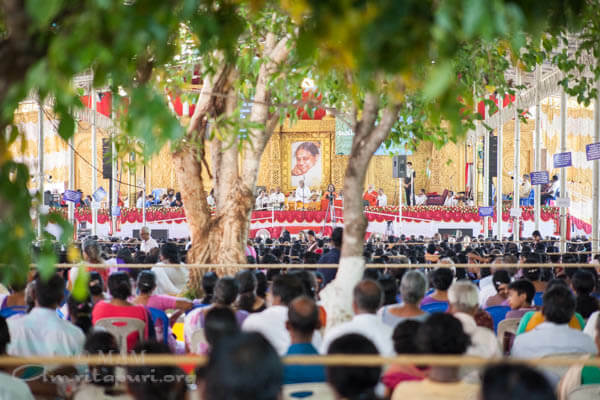 The barren landscape had few agricultural plots, making it difficult to find a suitable place to stop. 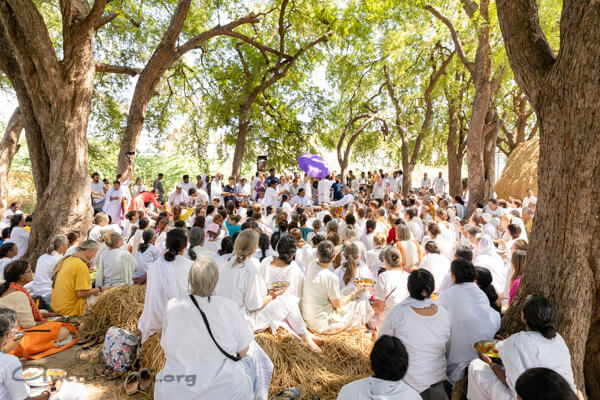 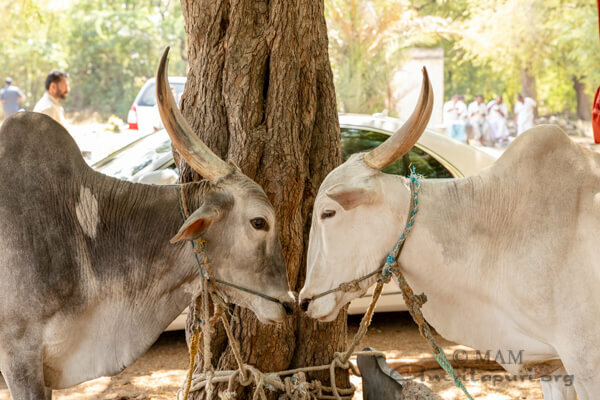 Finally, a rural farm was found near Gooty, with 15 large tamarind trees that provided shade for the 700+ tour staff. 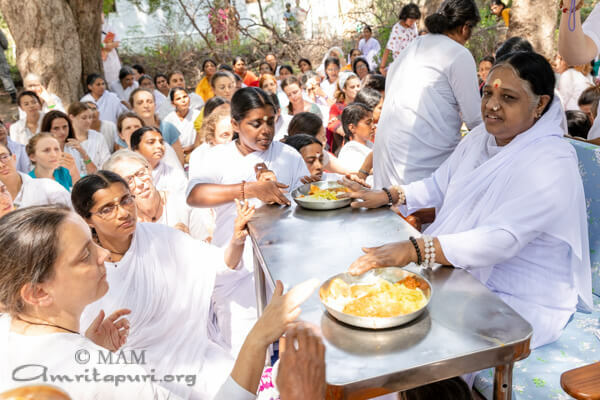 Amma invited all to meditate before she served lunch. 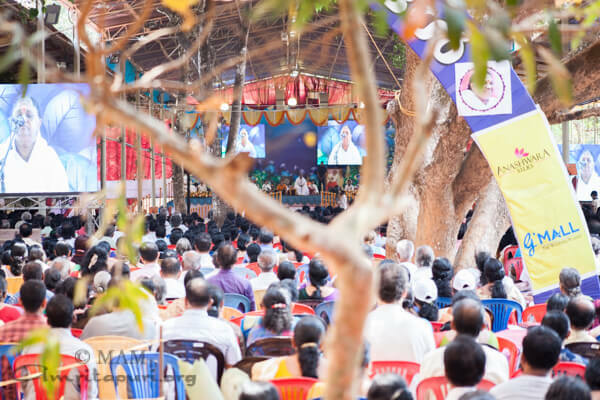 There were several monkeys in the trees. 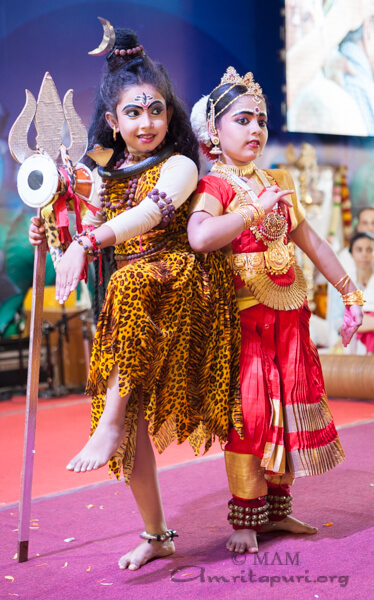 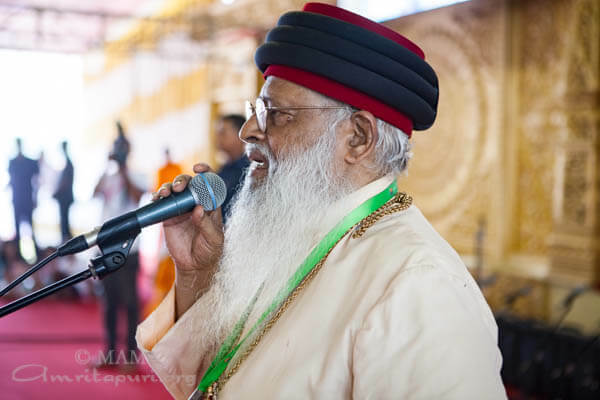 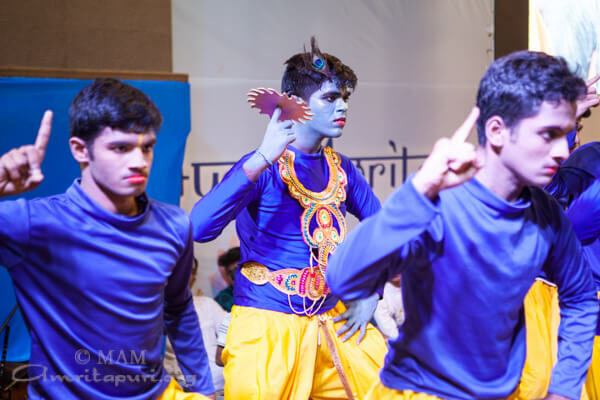 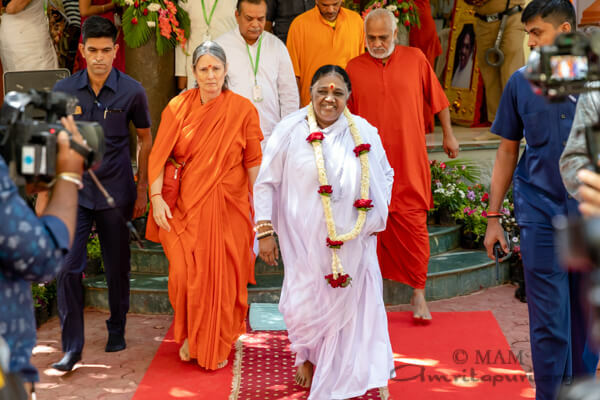 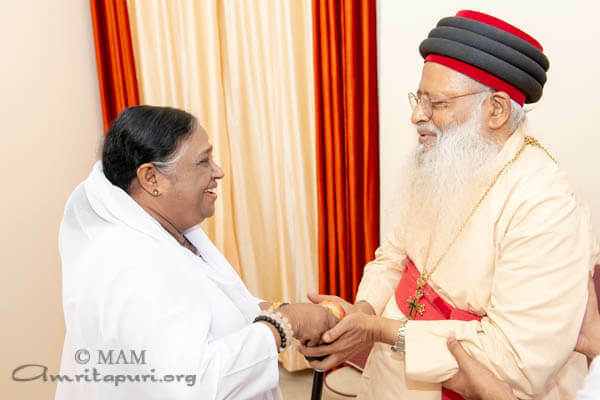 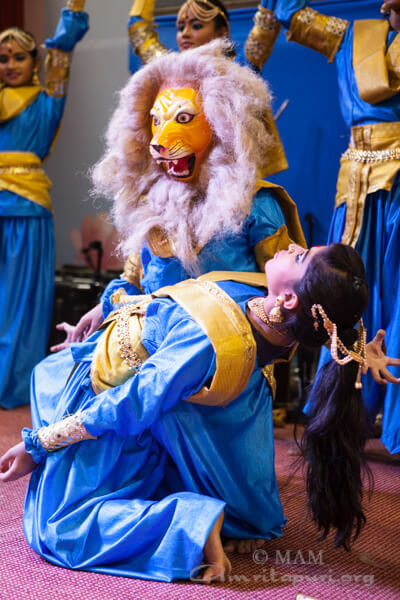 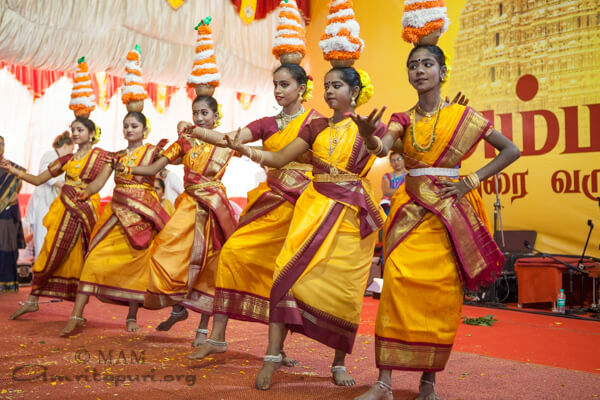 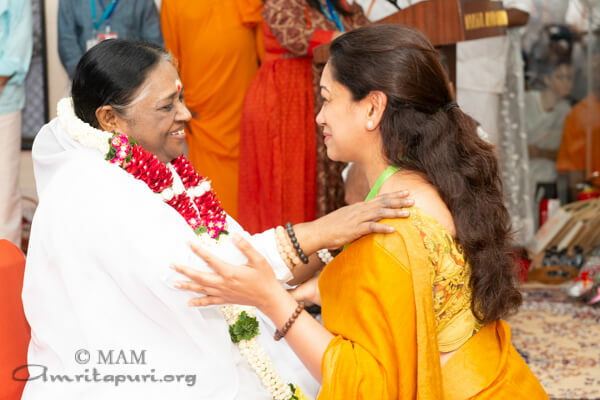 This inspired Amma to talk about the monkey god Hanuman, the faithful servant of Lord Rama and the symbol of love, faith, dedication, and service to the Guru. 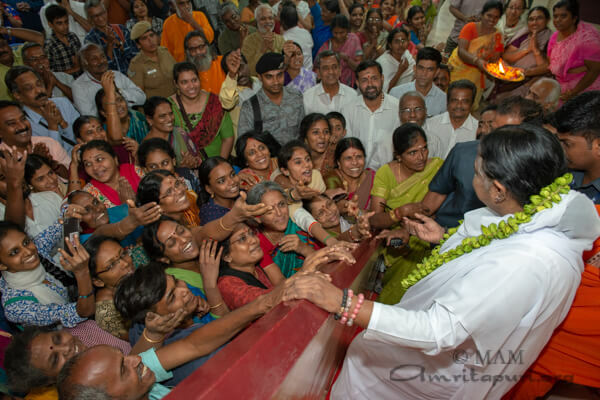 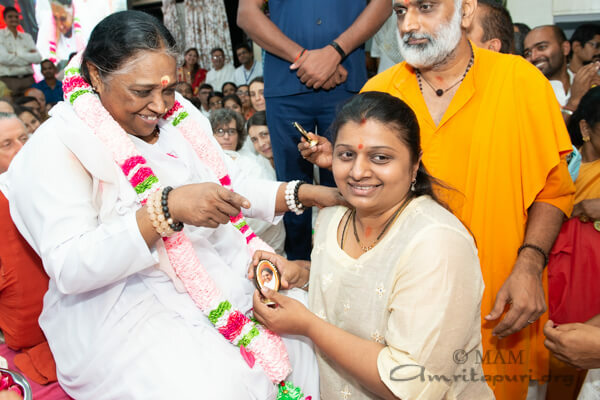 Amma also noted that since the completion of the Amrita Setu bridge, monkeys have also found their way to Amritapuri. 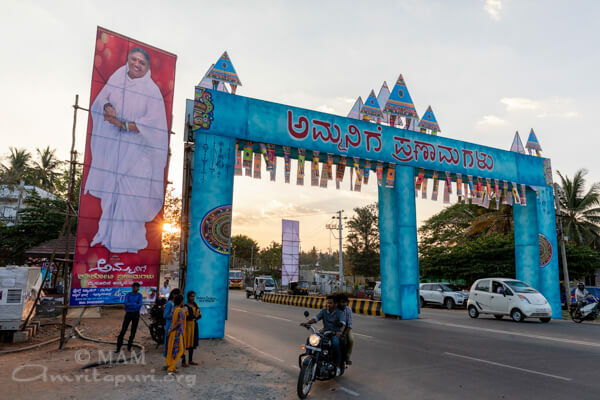 After another 5 hours on the dusty roads of Karnataka, just passed the river Krishna, Amma again stopped, this time for bhajans, chai and dinner. 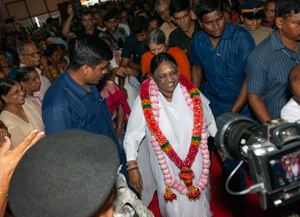 In the background on either side of Amma, two big hills could be seen. 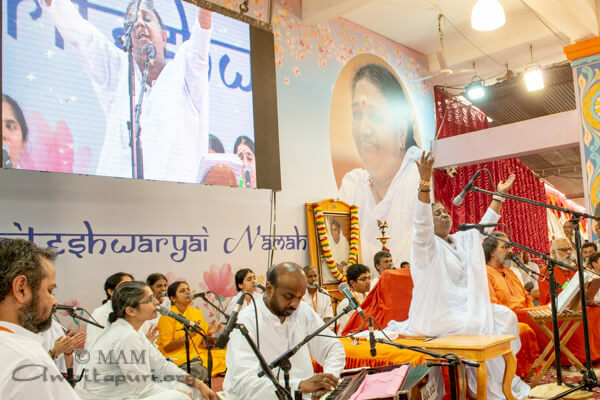 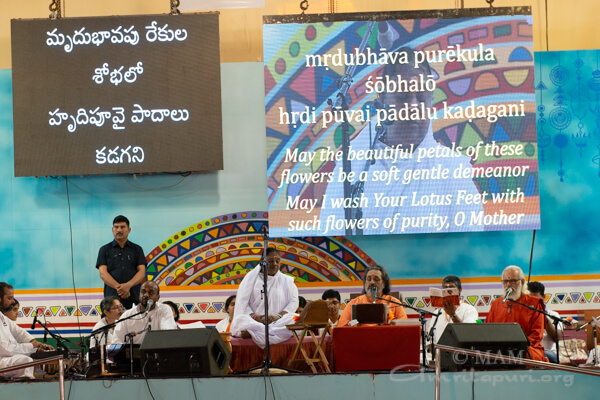 Amma took time to sing some bhajans in Marathi, the local language. 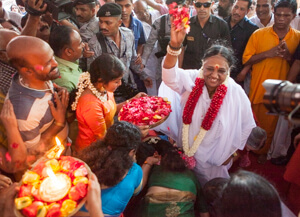 She sang ‘Vithala, Vithala, Vithala’ faster and faster, charging all with energy for the last 4 hours of the trip. 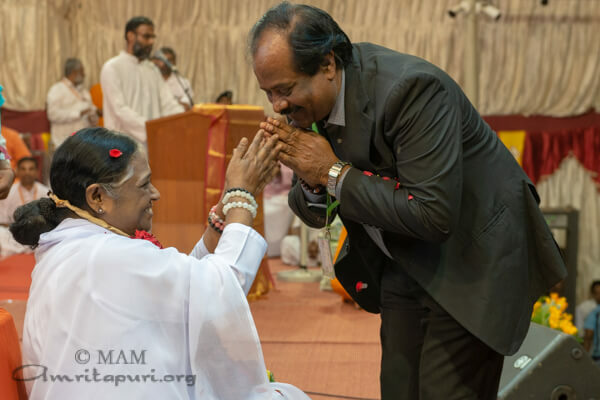 After serving chapattis and curry, Amma asked for a story. 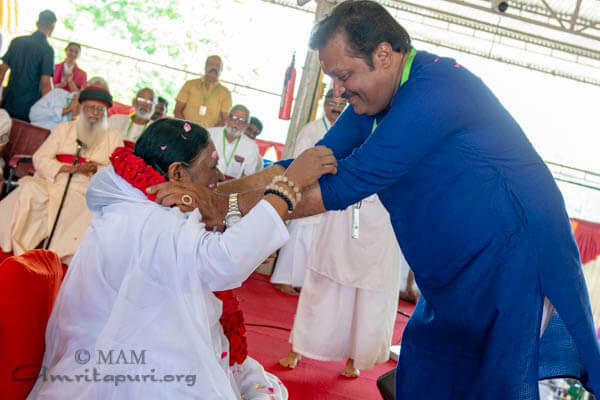 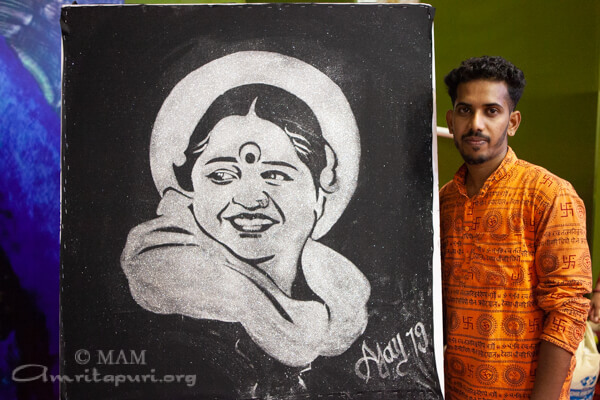 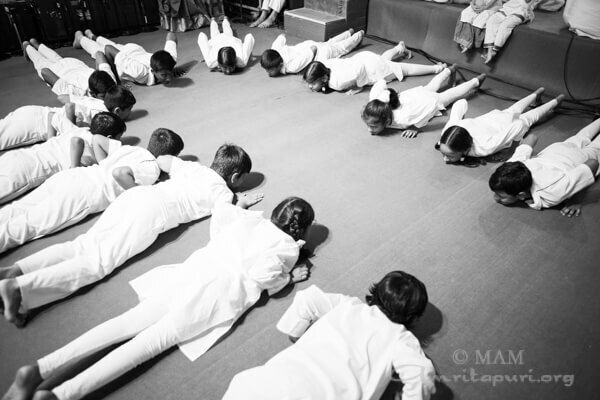 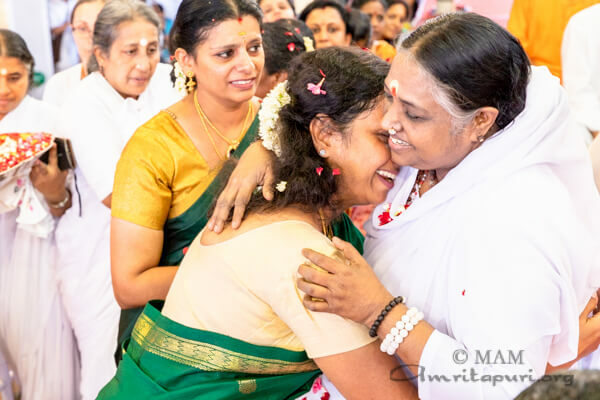 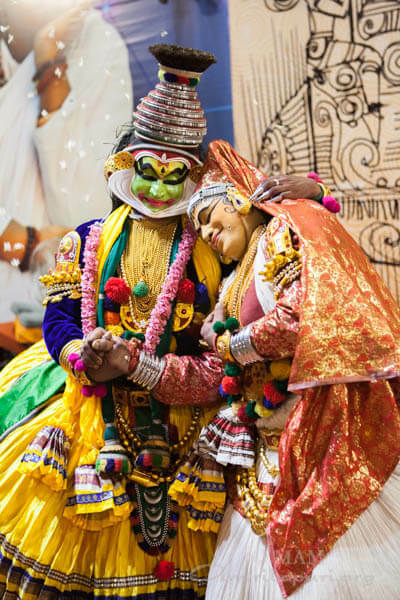 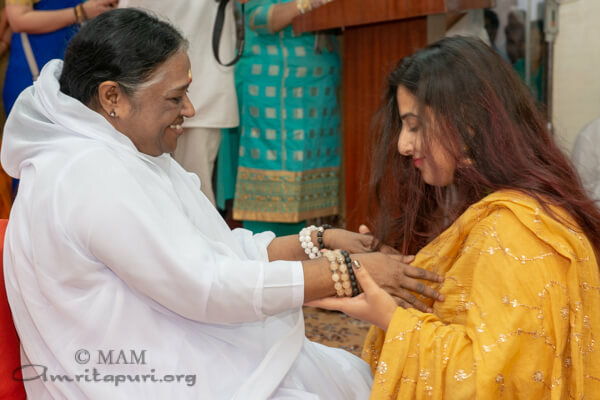 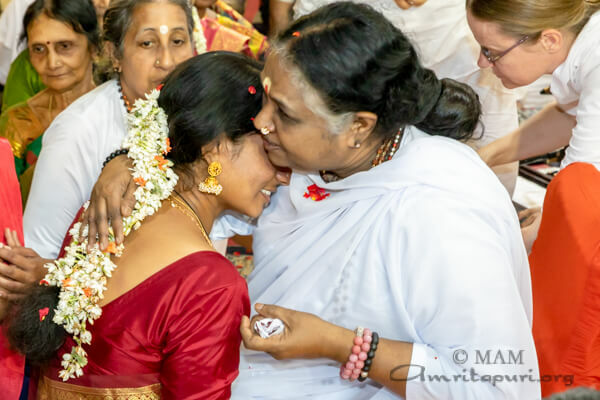 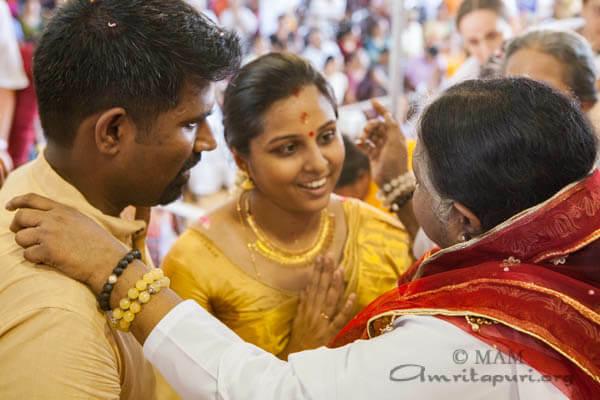 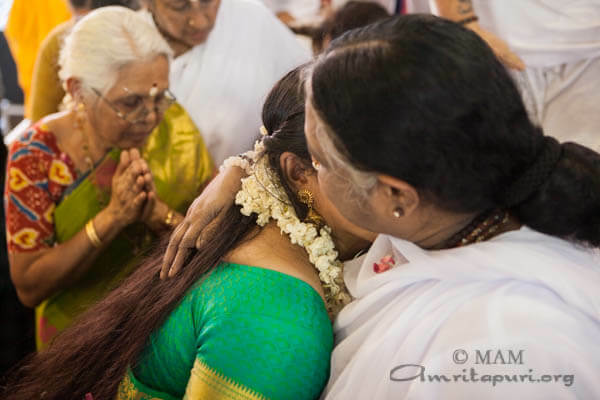 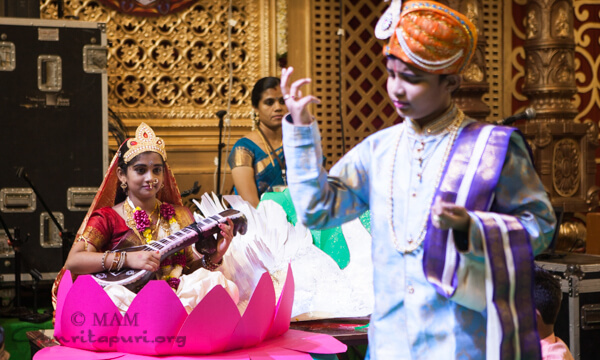 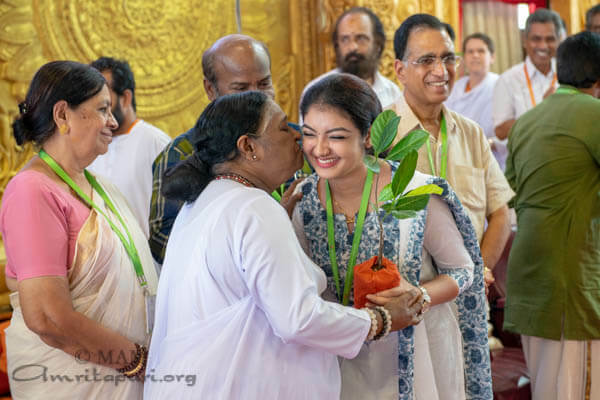 One of Amma’s children told of a dream in which she pleaded to Amma to give her love, devotion and surrender. 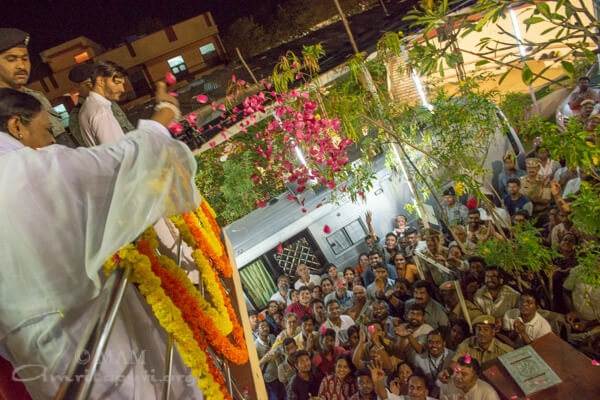 And as the moon lit up the darkness, all knew that one day this dream would come true. 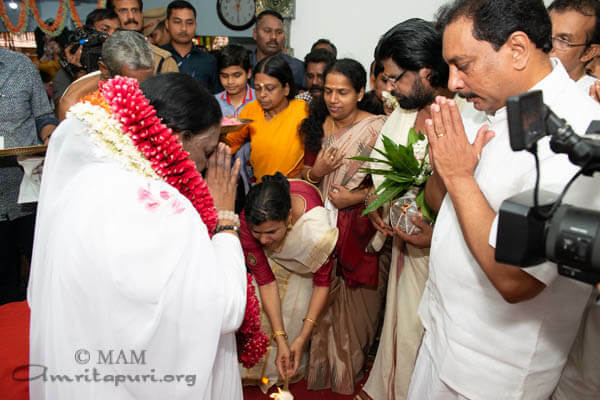 Amma arrived in Bengaluru from Mysuru for two days Brahmasthanam Festival. 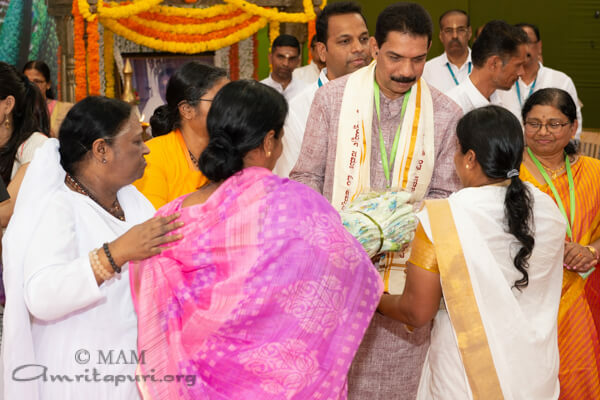 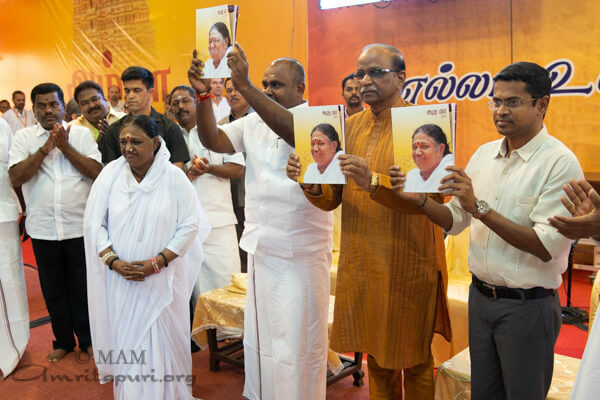 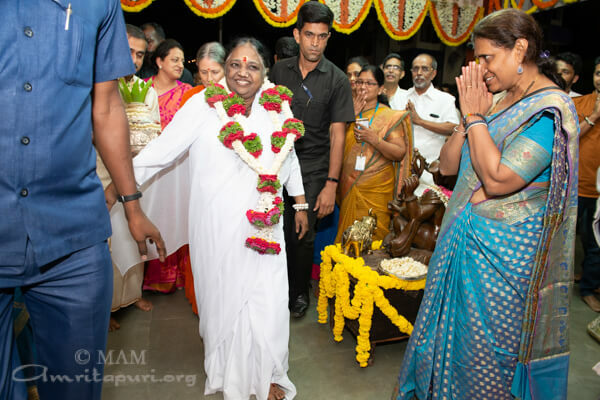 At the start of the programs, many dignitaries welcomed and garlanded Amma. 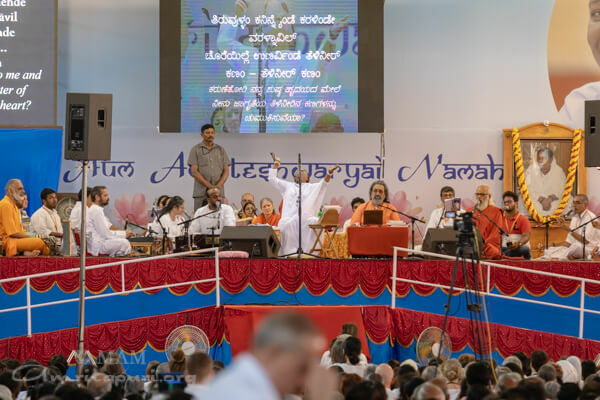 Among them were Justice N. Kumar, Former High Court Judge; Justice Subhash B. Adi, Former High Court Judge & Upa Lokayukta; Justice Ashok Hinchigeri, Former High Court Judge; Ms. Dana Kursh, Consul General Israel in Bengaluru; Sri. 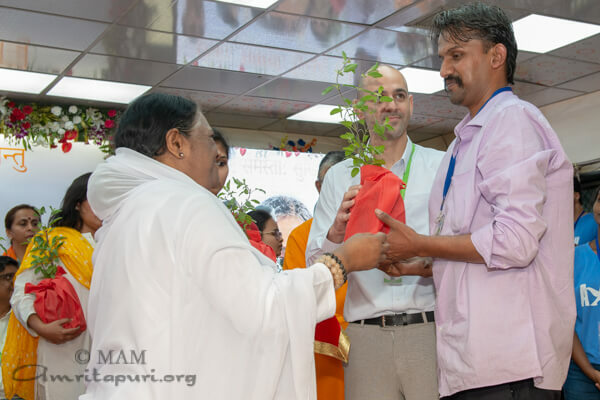 Ramachandra Bhat, Vice Chancellor VYASA University; Dr. V.V. 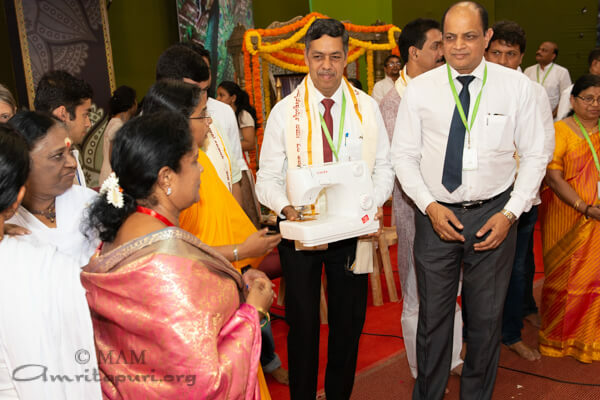 Srinivasan, Director, ISRO Telemetry & Tracking Centre; Mr. Tarun Kumar, Regional Officer CBSE; and Mr. Ponnappa, Head of Sony Indian Broadcast. 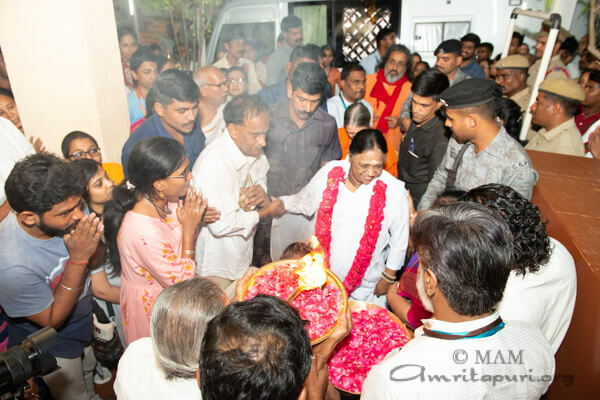 Many other dignitaries were present. 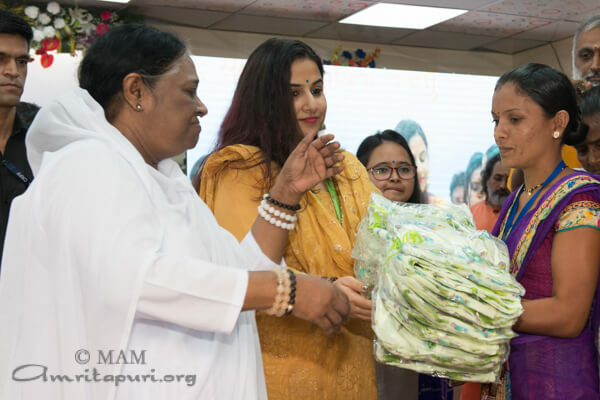 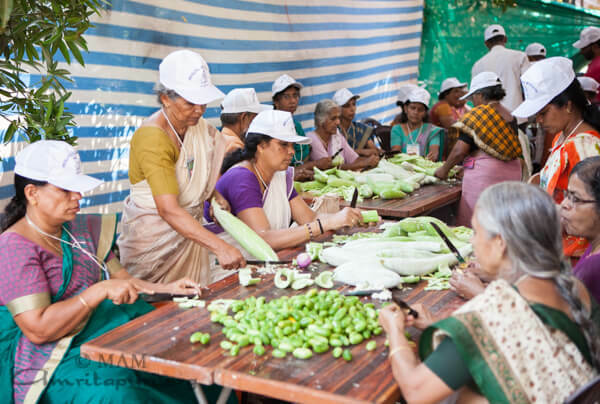 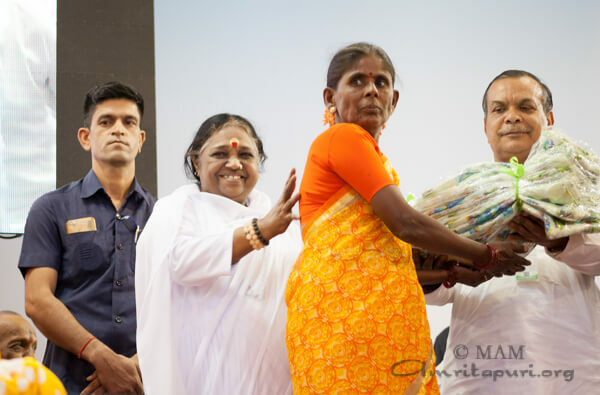 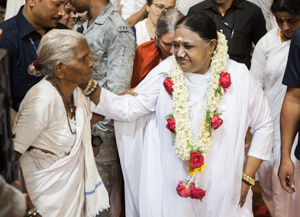 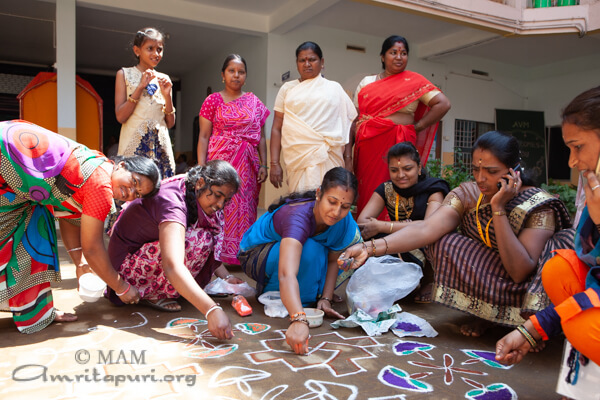 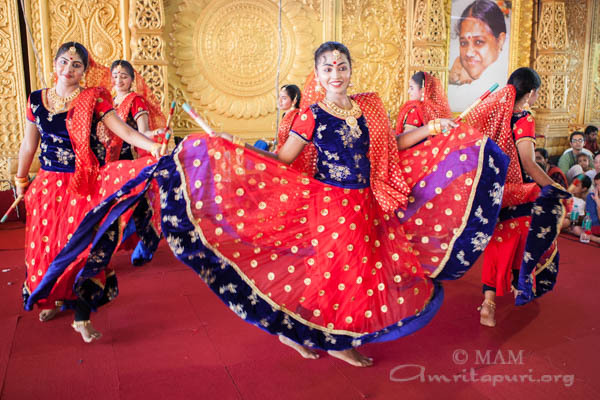 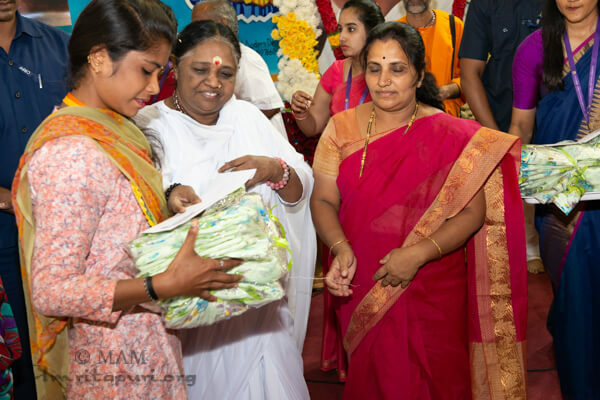 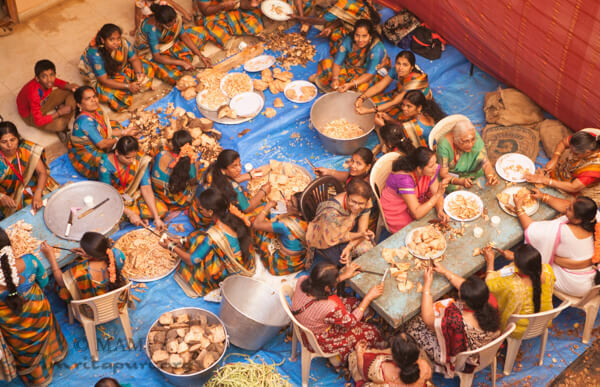 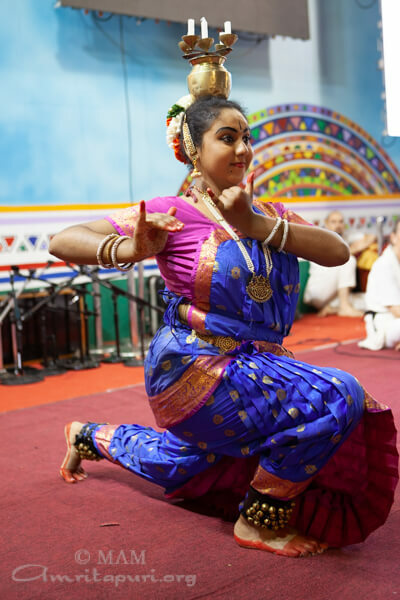 During the opening ceremonies, Amma gave away saris to AmritaSREE Self-Help group members. 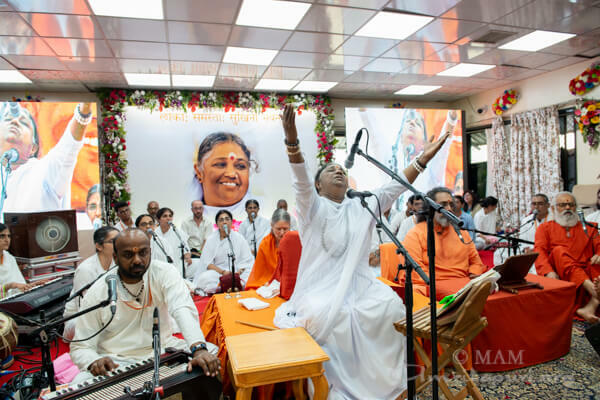 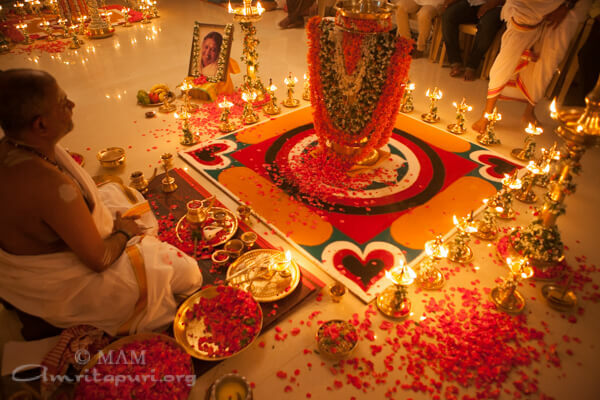 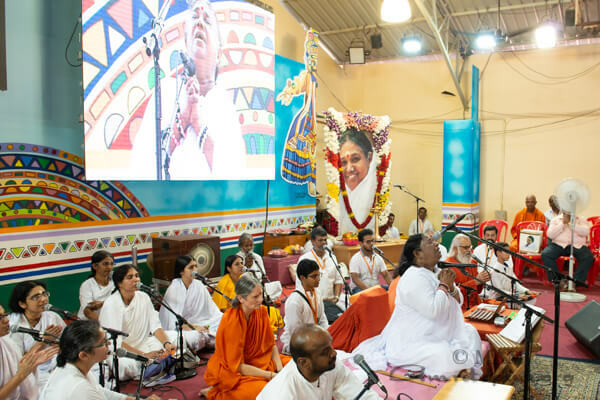 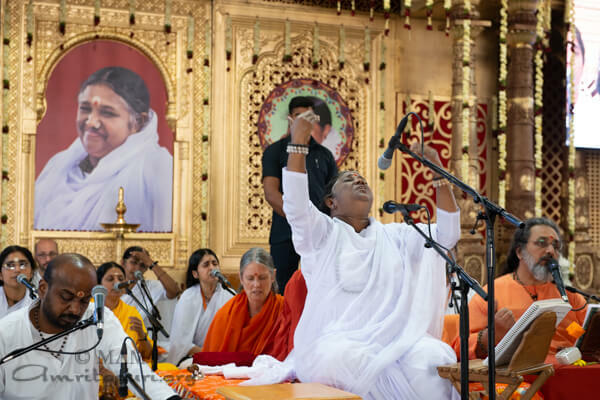 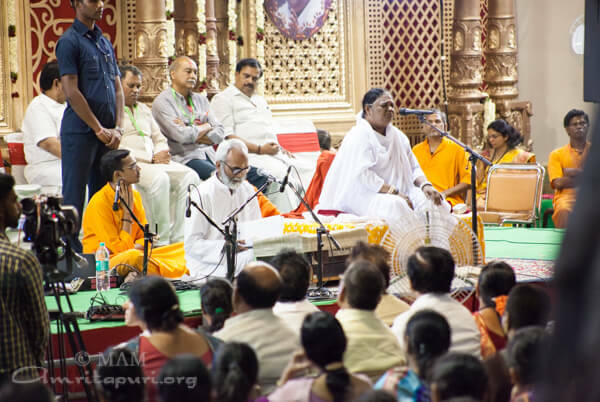 Amma gave satsang and sang bhajans, and also led everyone in manasa puja and meditation. 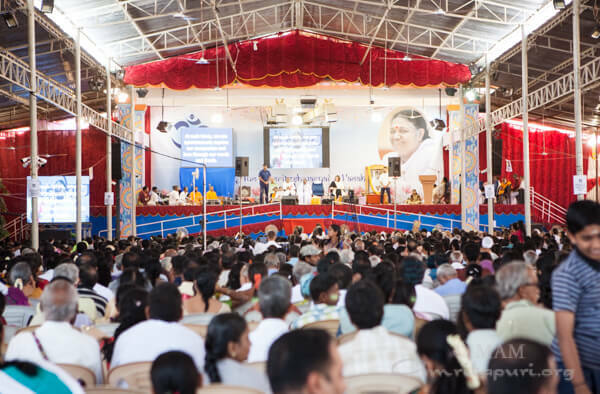 Amma gave instructions in Kannada, the local language. 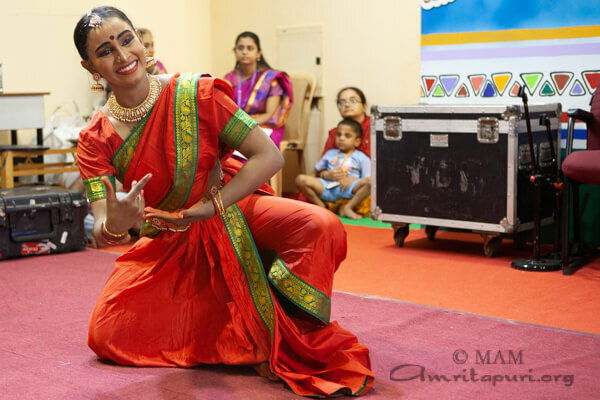 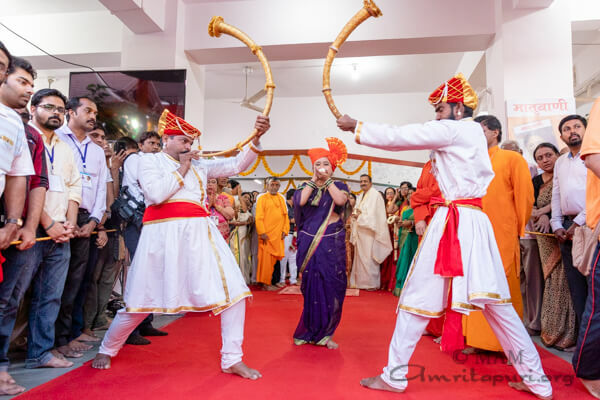 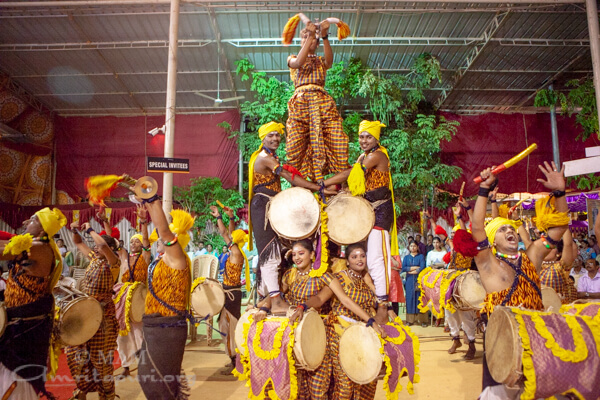 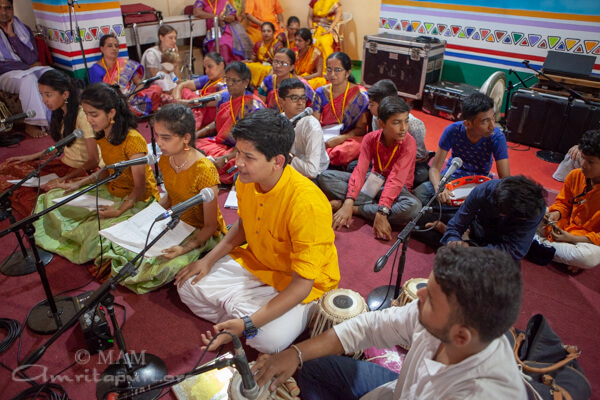 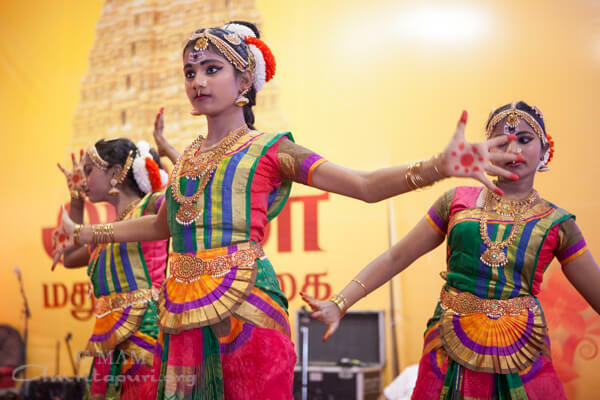 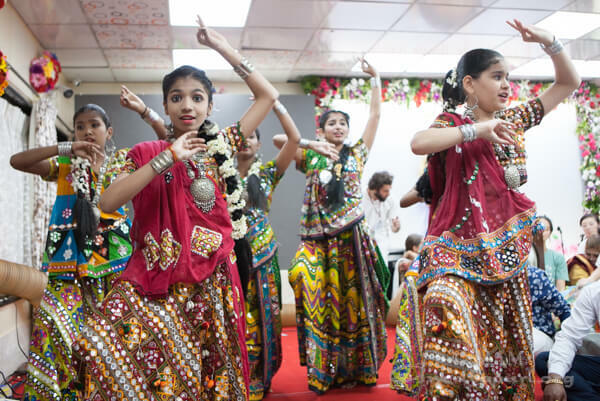 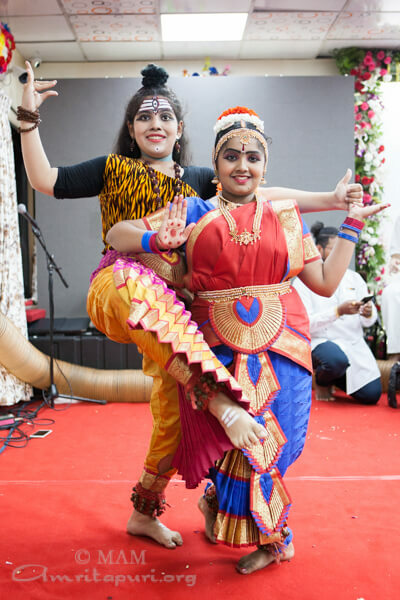 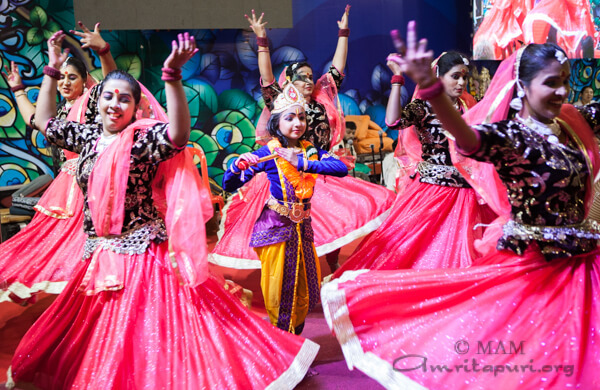 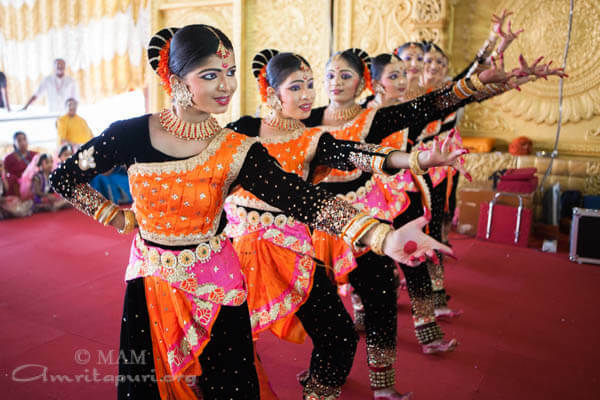 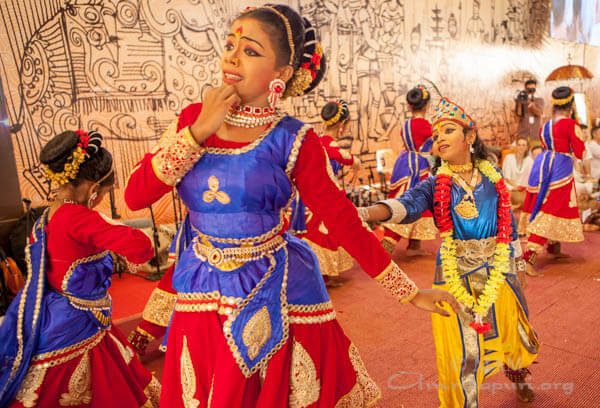 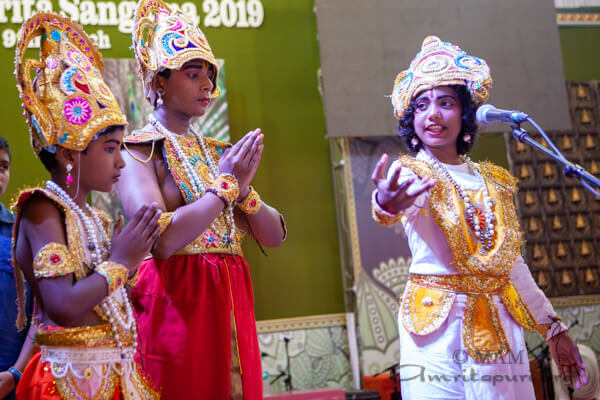 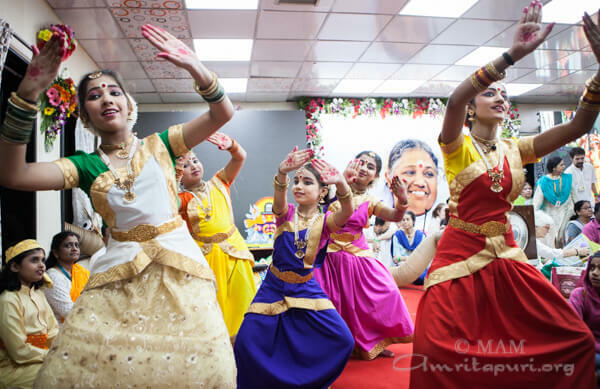 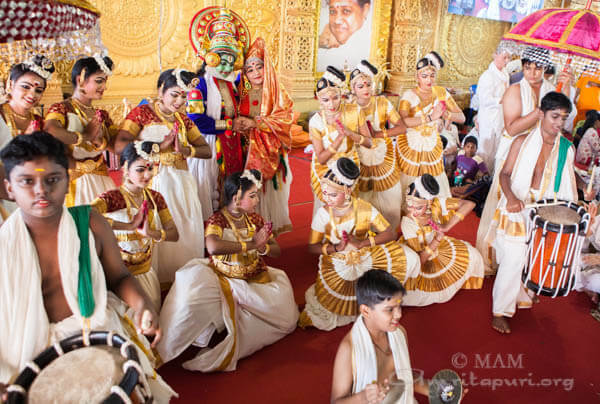 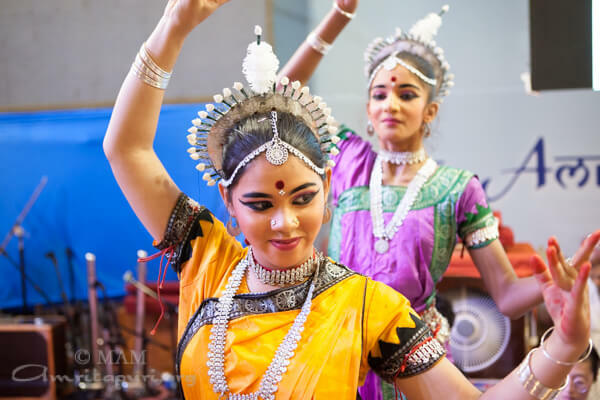 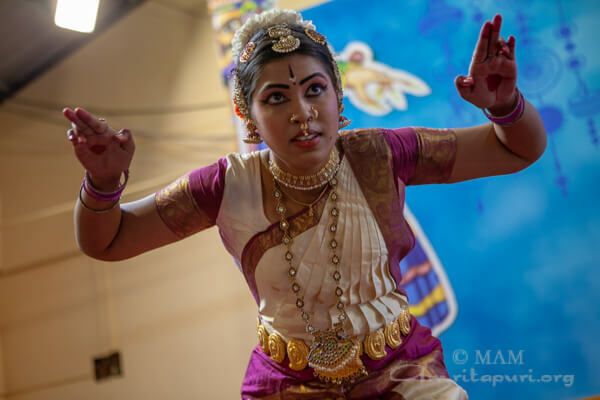 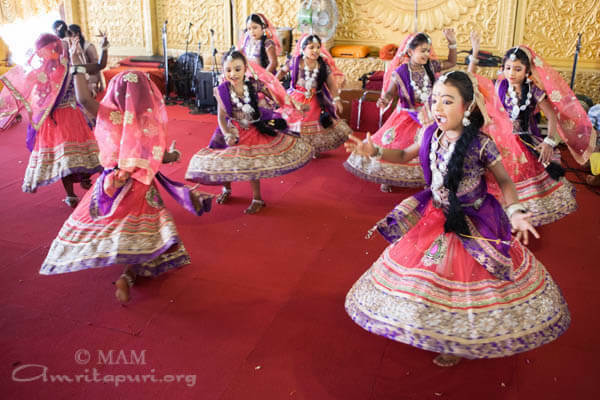 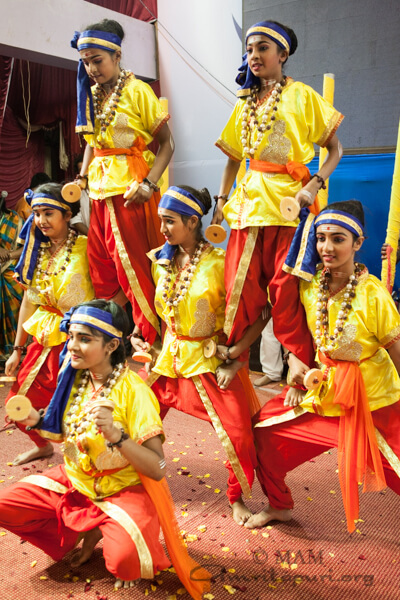 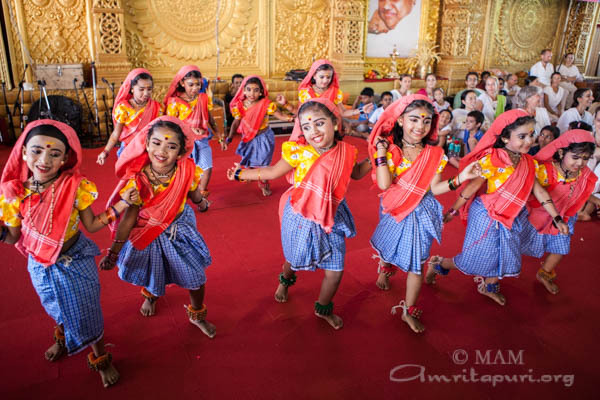 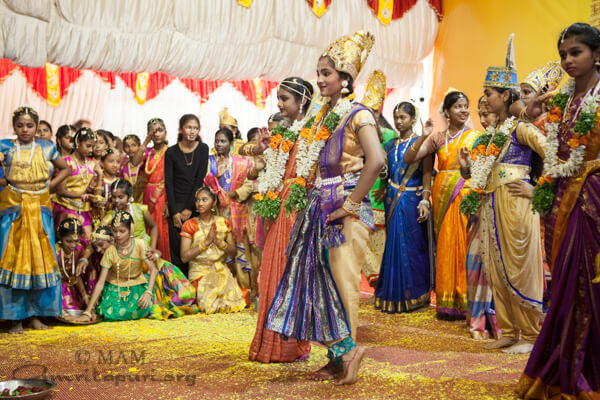 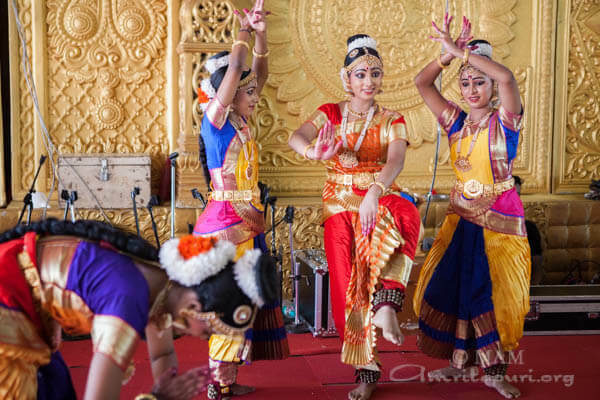 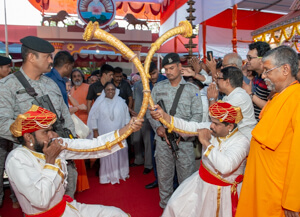 During Darshan, Amrita Vidyalayam students and students of Amrita Vishwa Vidya Peetham – Mysore, presented different cultural programs.